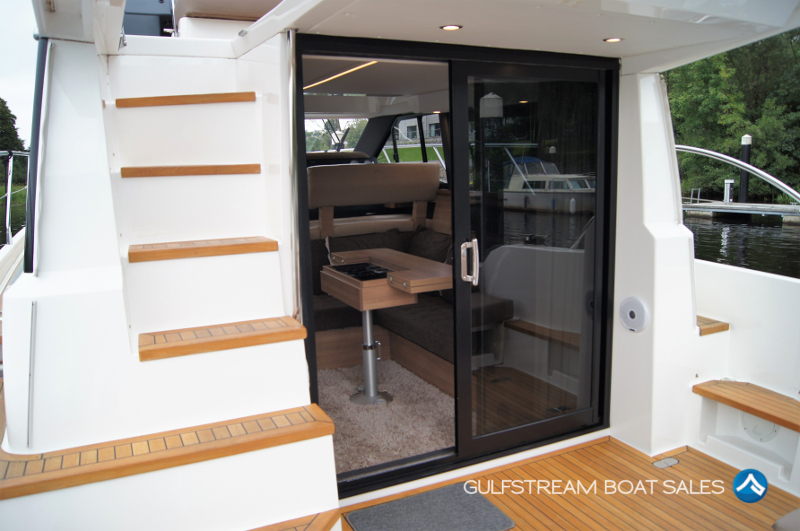 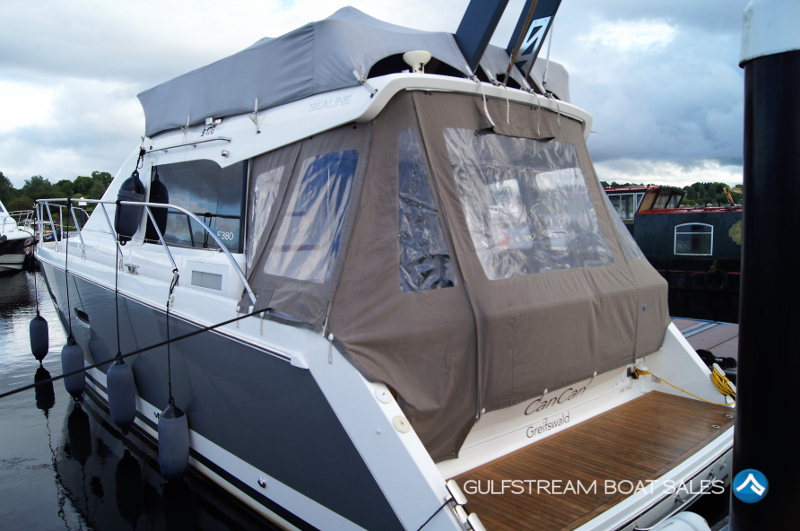 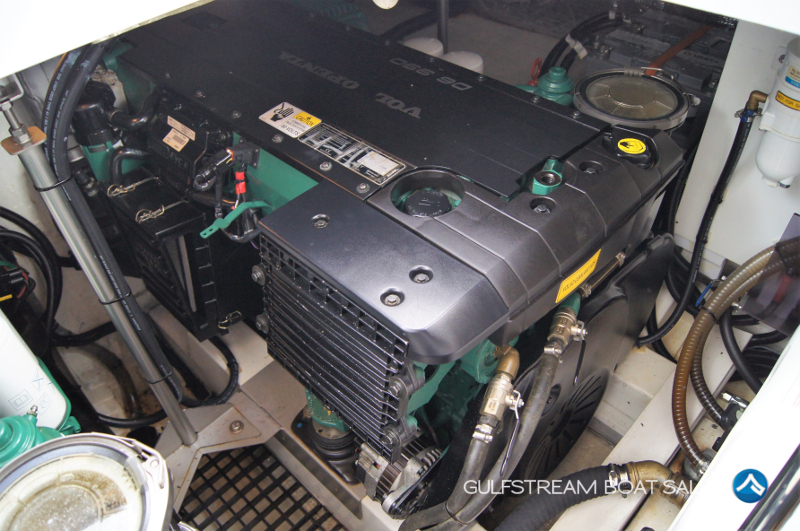 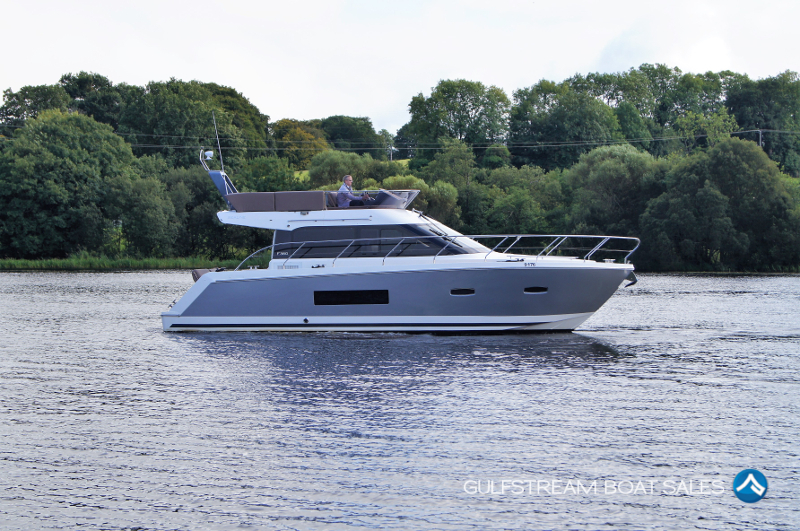 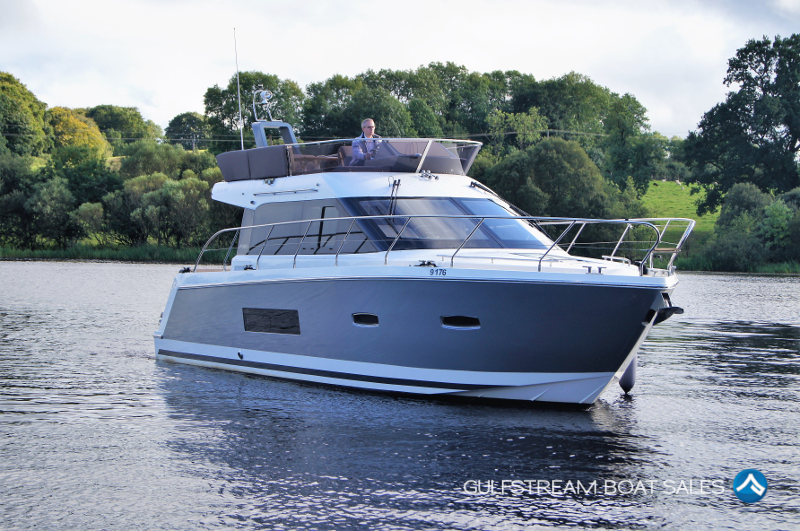 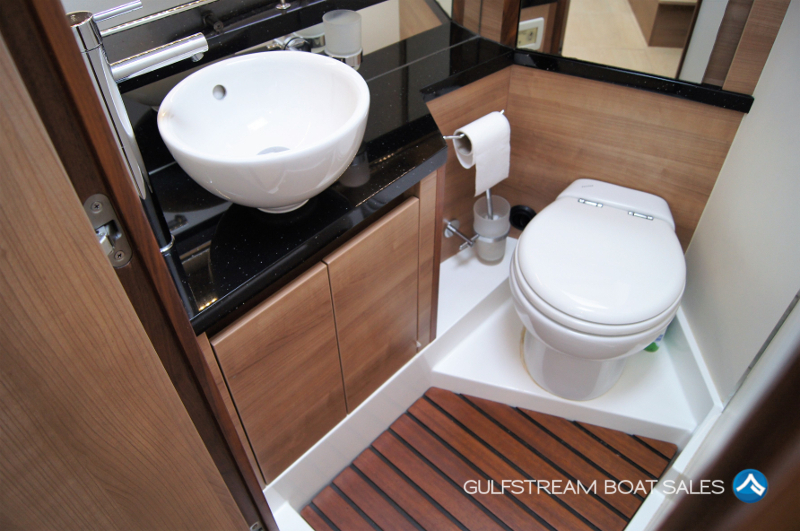 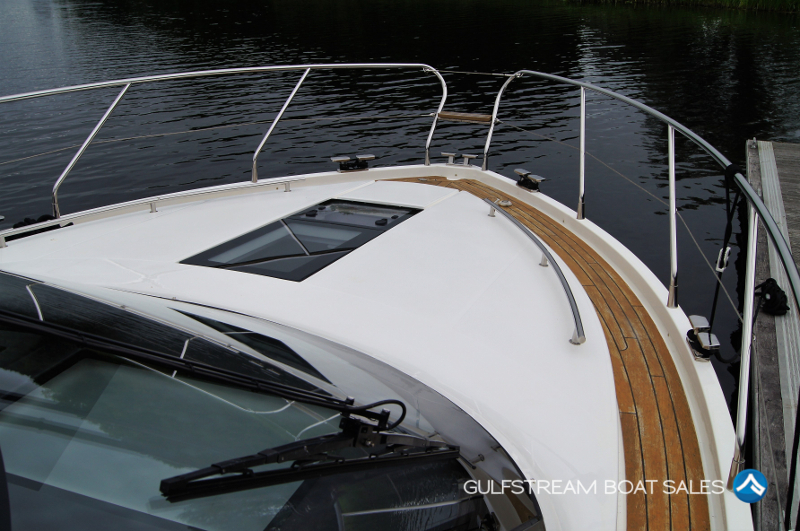 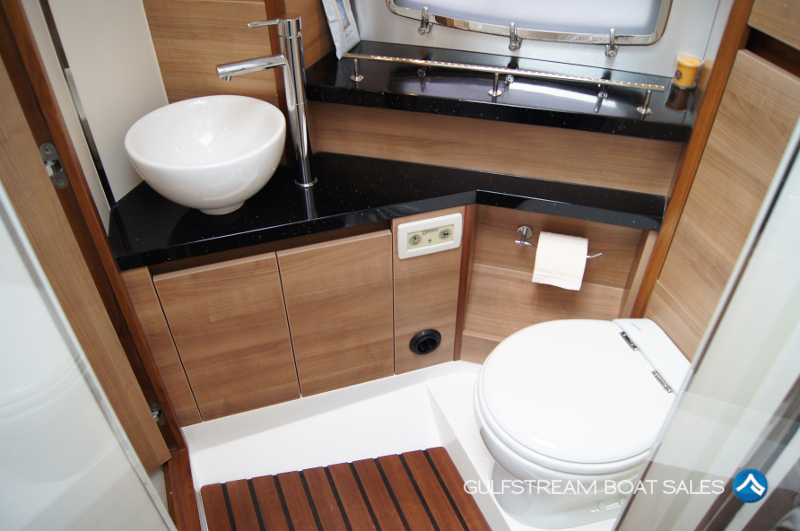 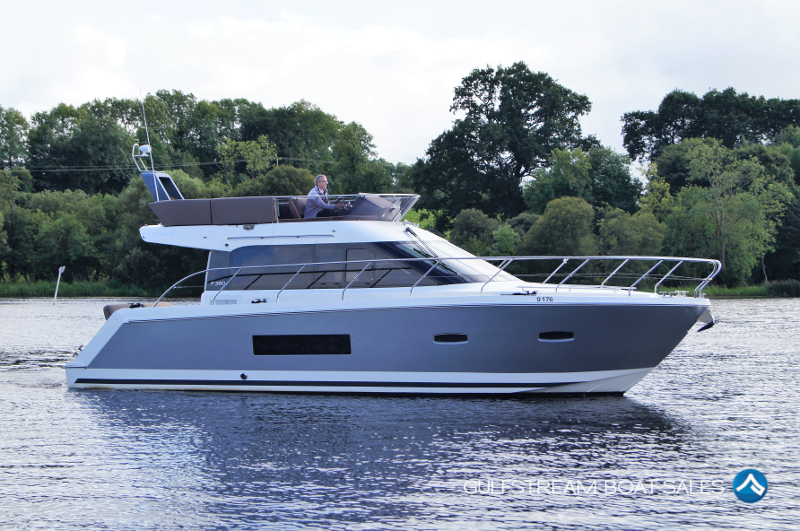 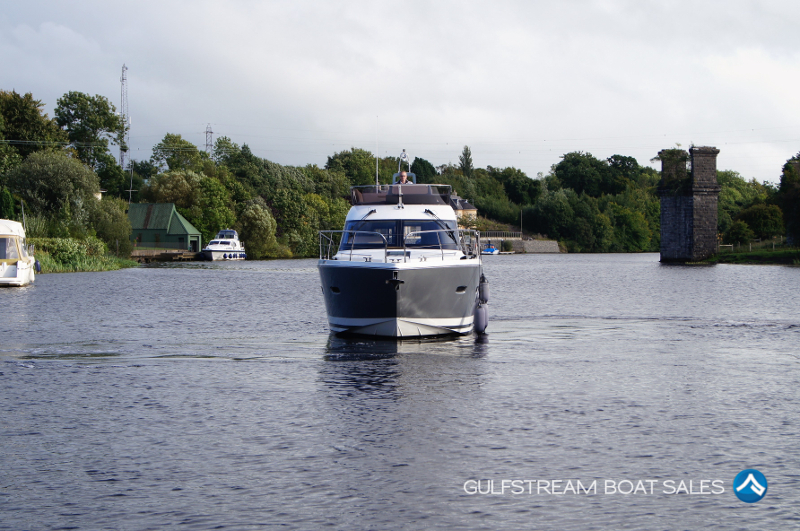 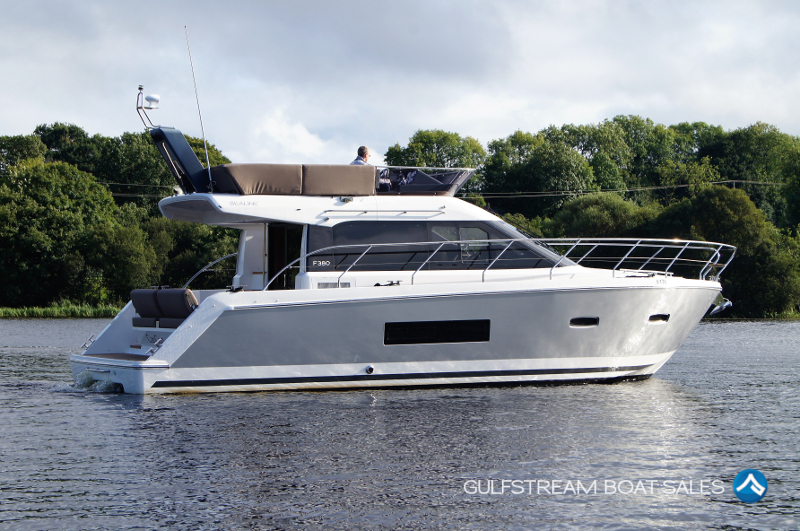 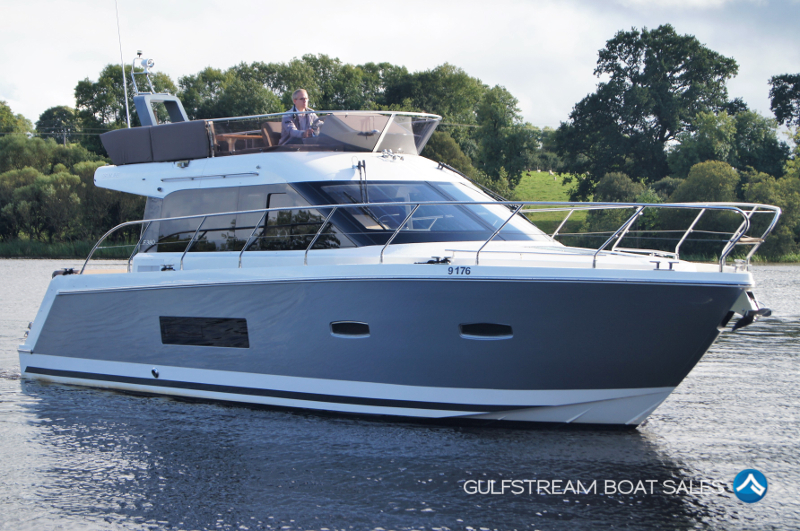 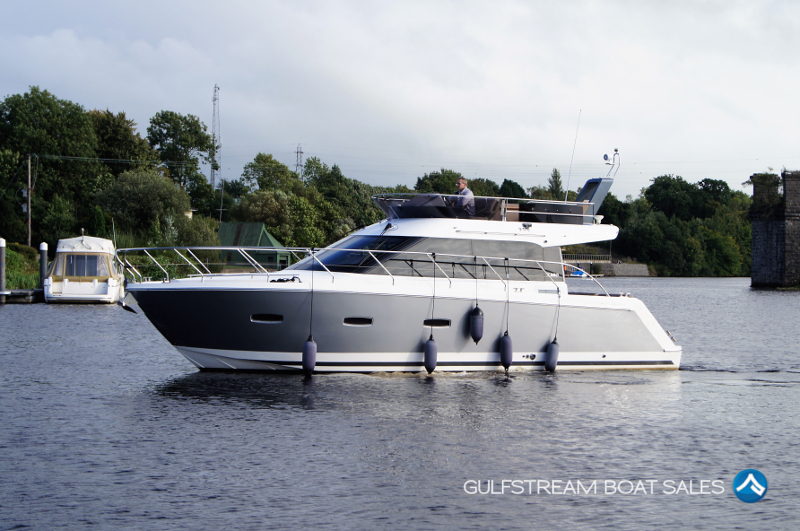 This Sealine F380 was one of the first Sealines built in Germany under new Hanse Ownership in 2014. 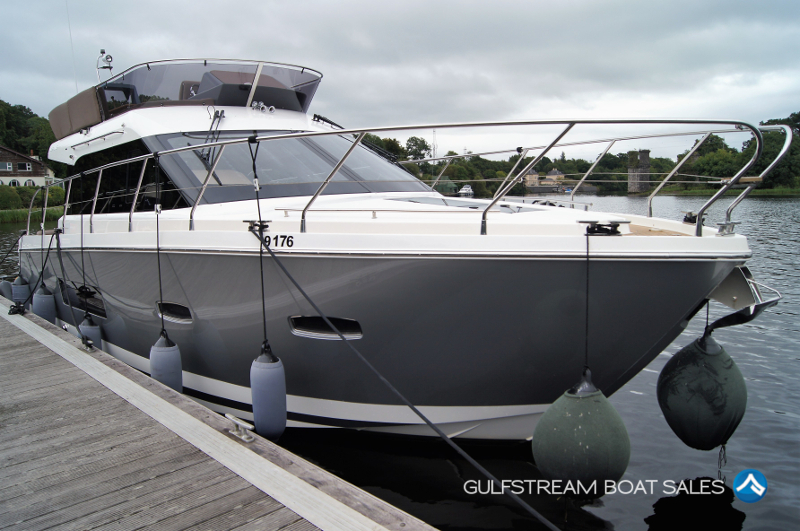 She was sold to her one and only owner in Spring 2015. 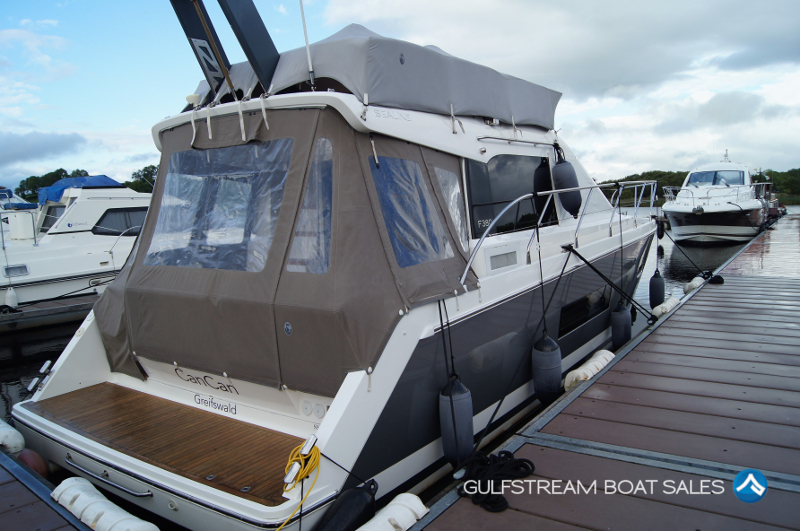 It is in like new condition and has an incredible specification. 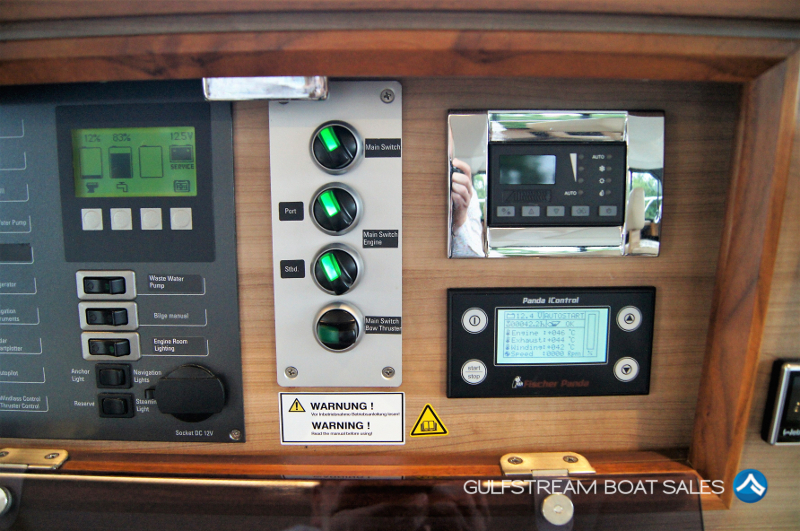 It looks to me like every option box was ticked on this build. 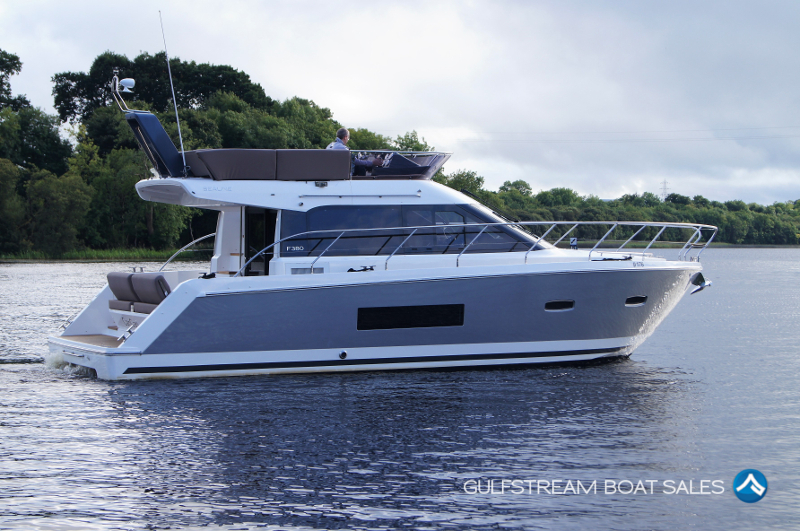 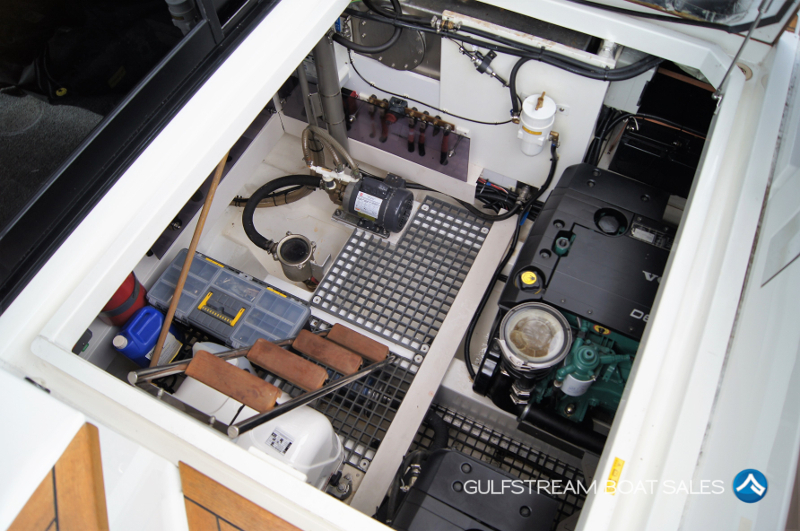 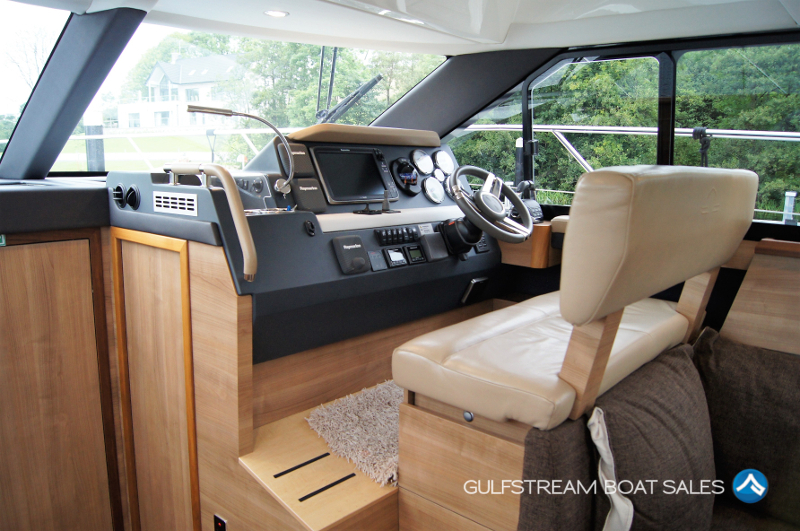 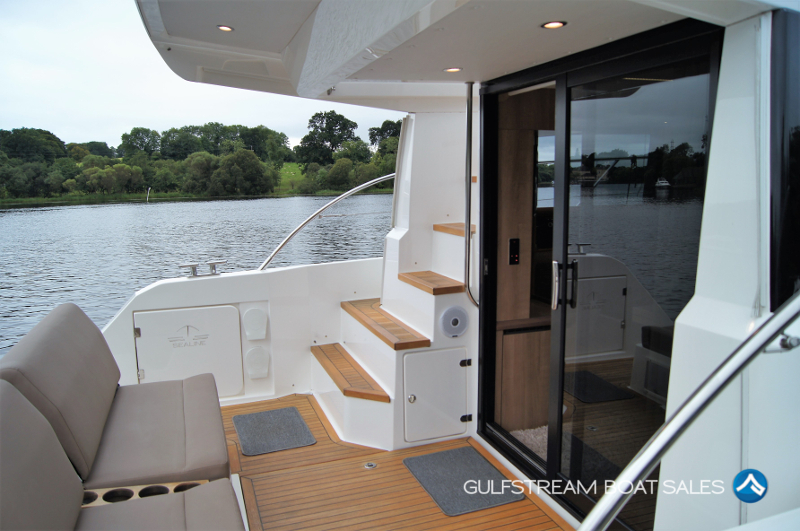 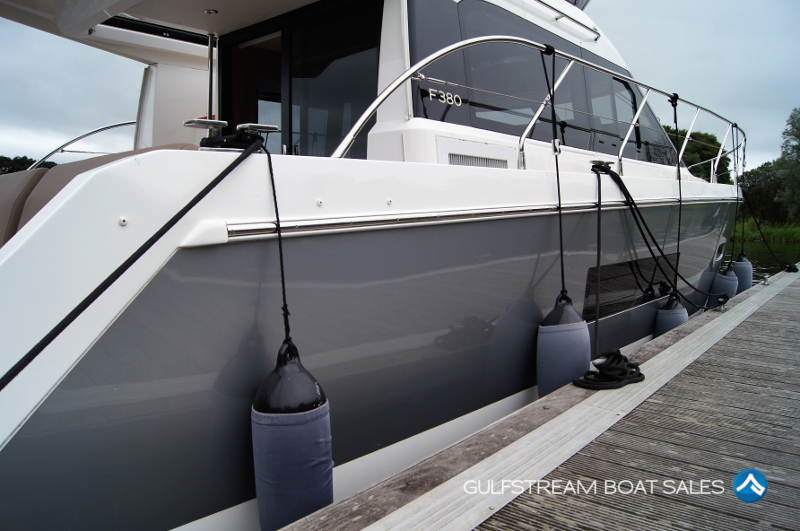 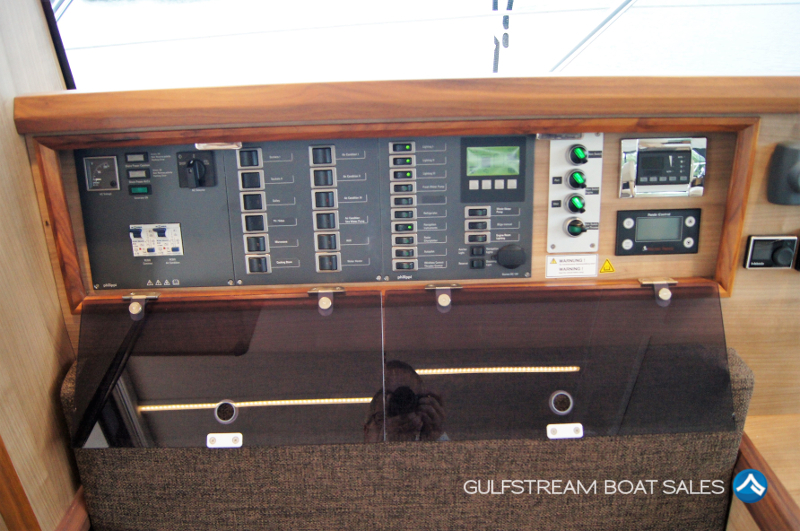 She has literrally everything you could want including Onboard Generator, Air Con, Heating, Full Raymarine Navigation Equipment at Both Helms, Autopilot, Bow Thruster, Teak Decking Throughout, Flybridge Bimini and Foredeck Sunpads. 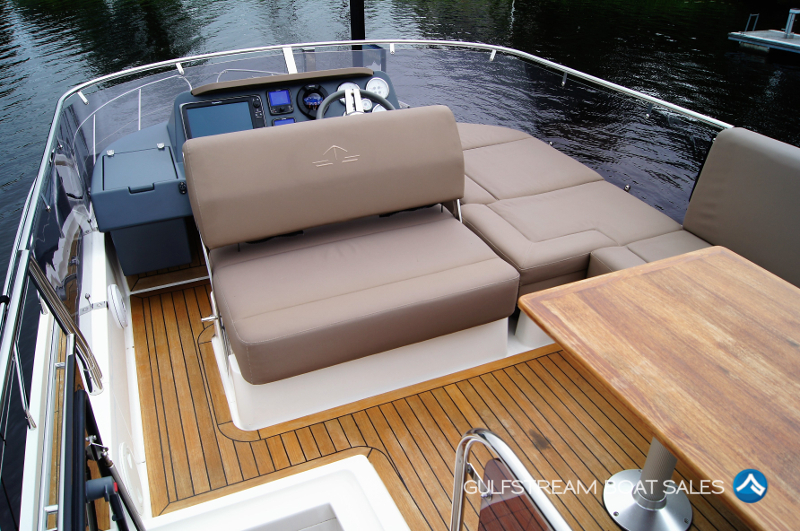 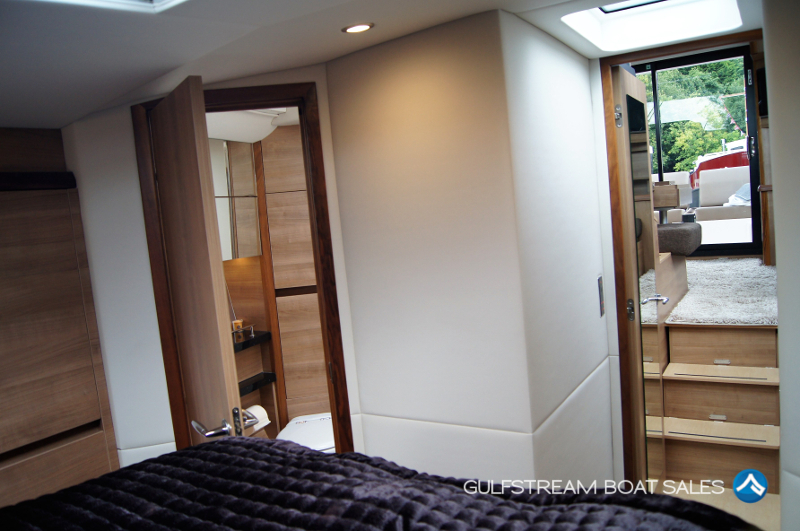 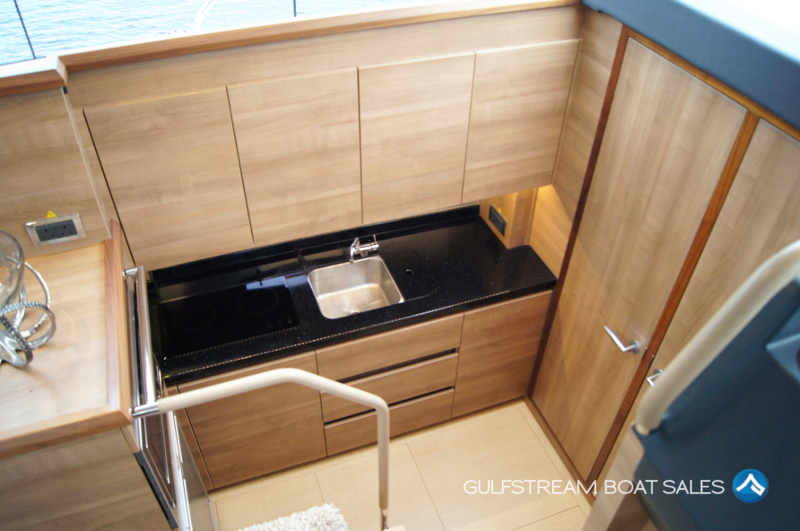 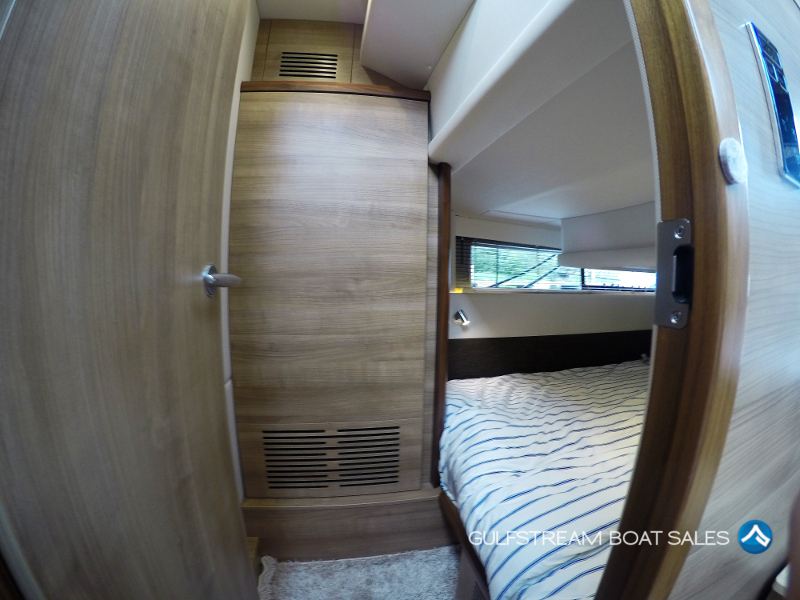 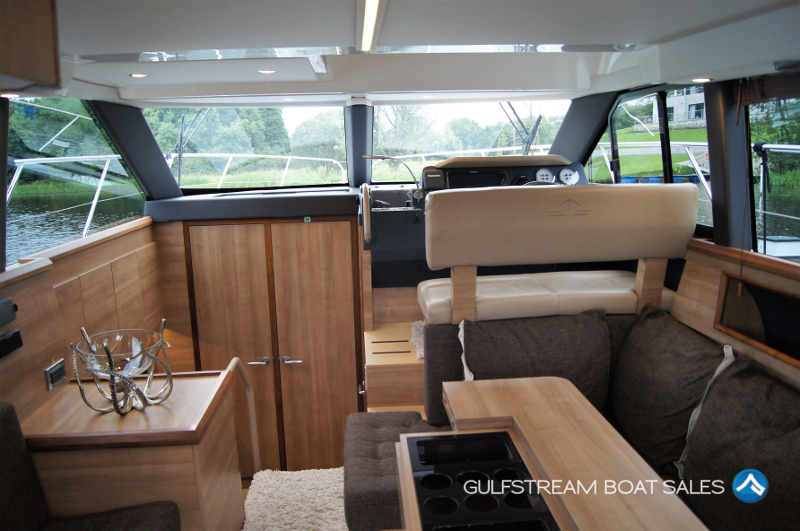 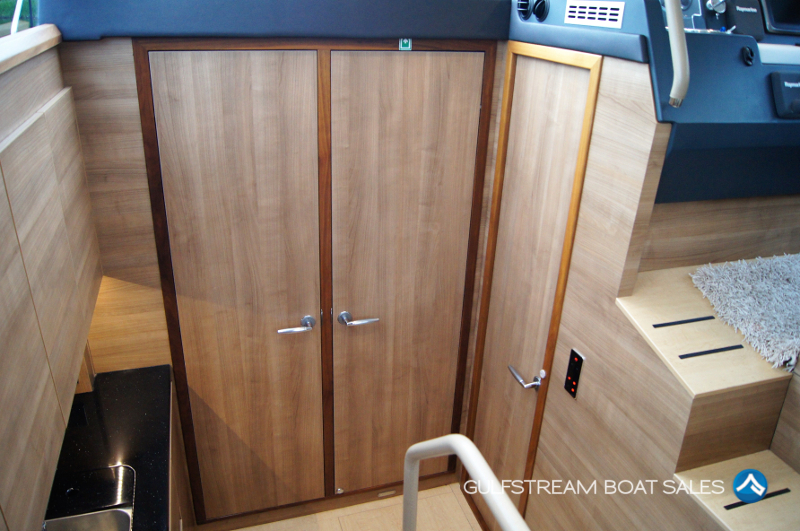 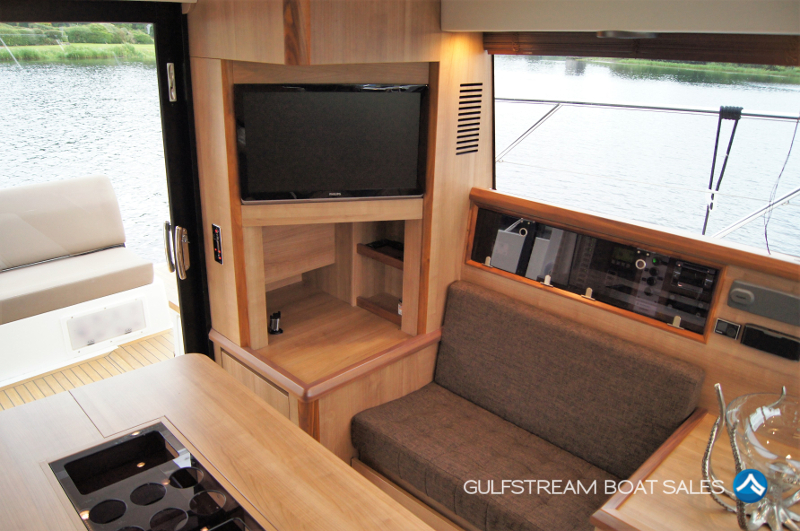 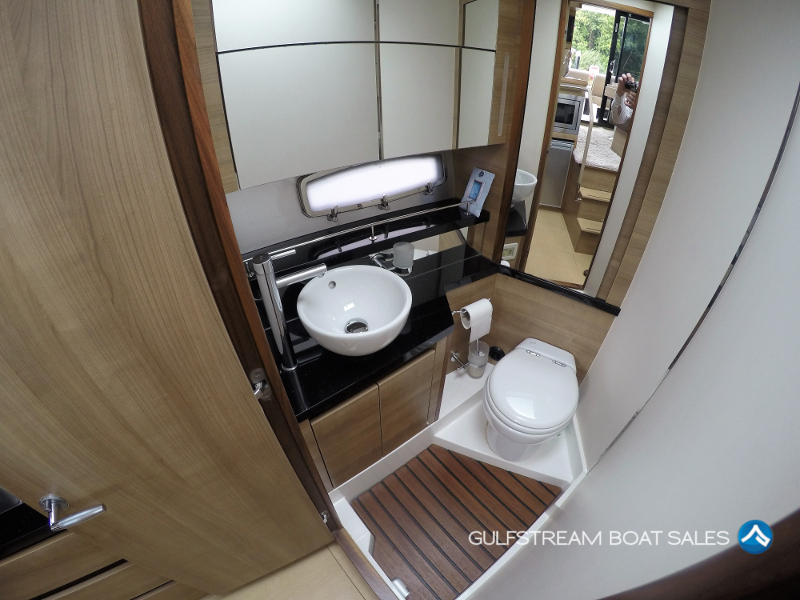 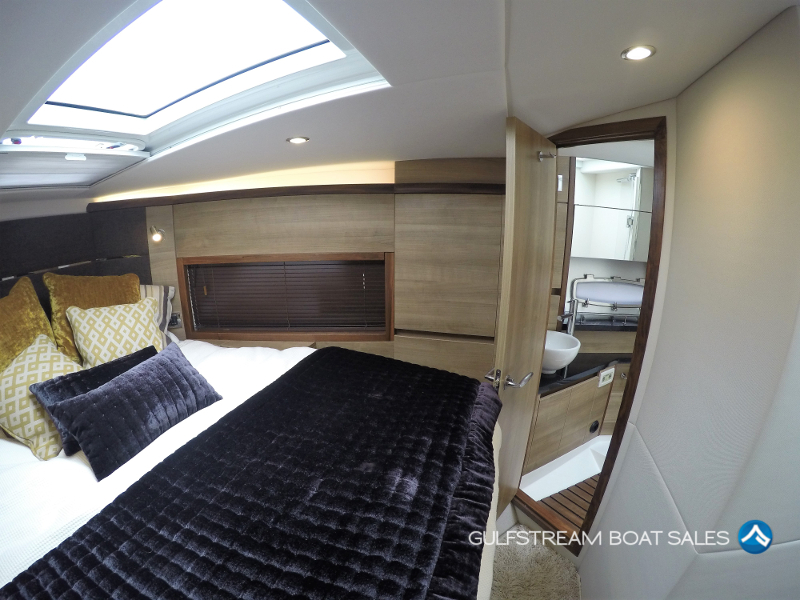 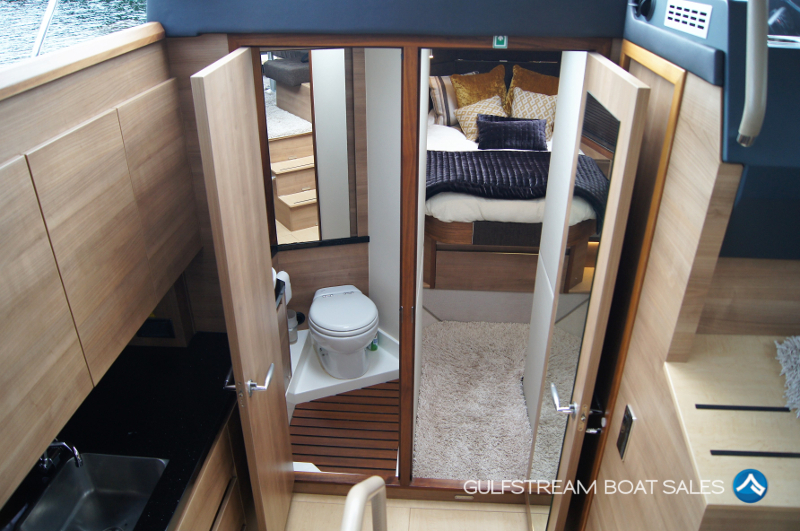 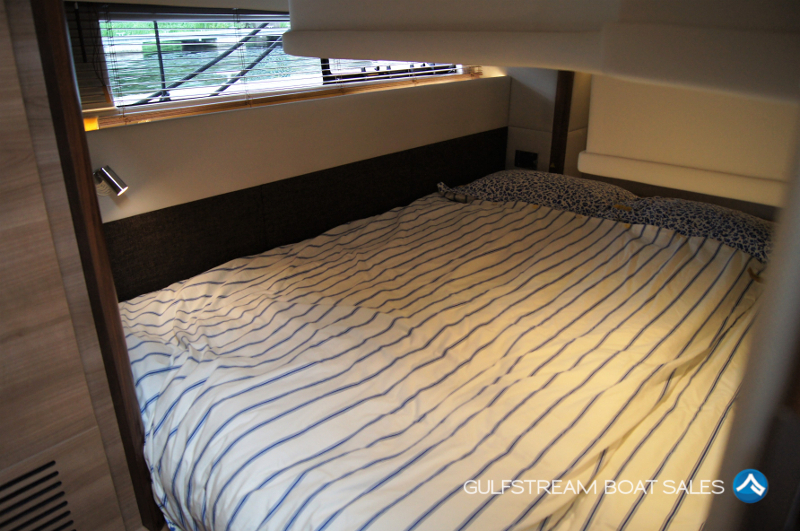 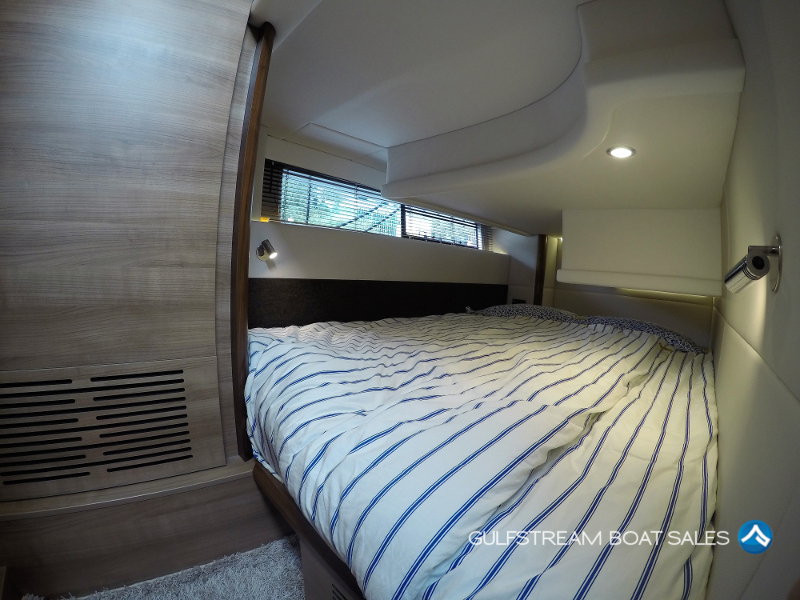 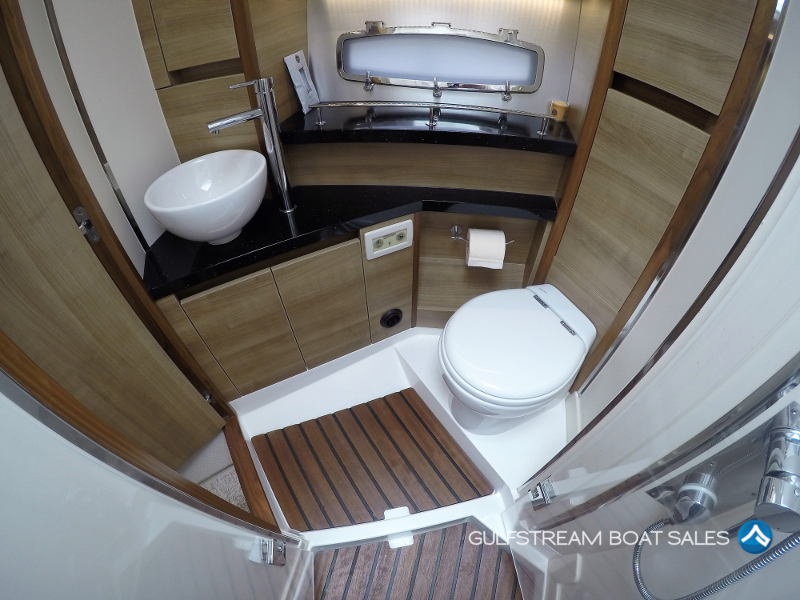 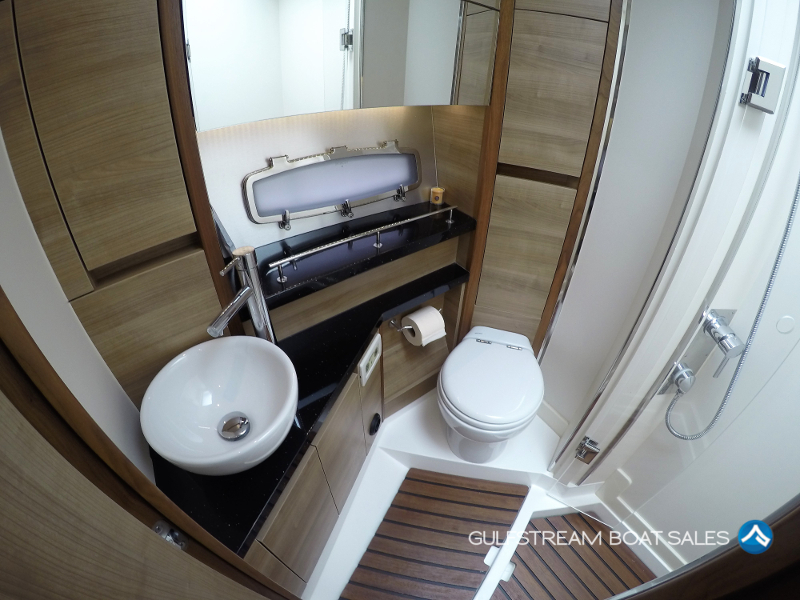 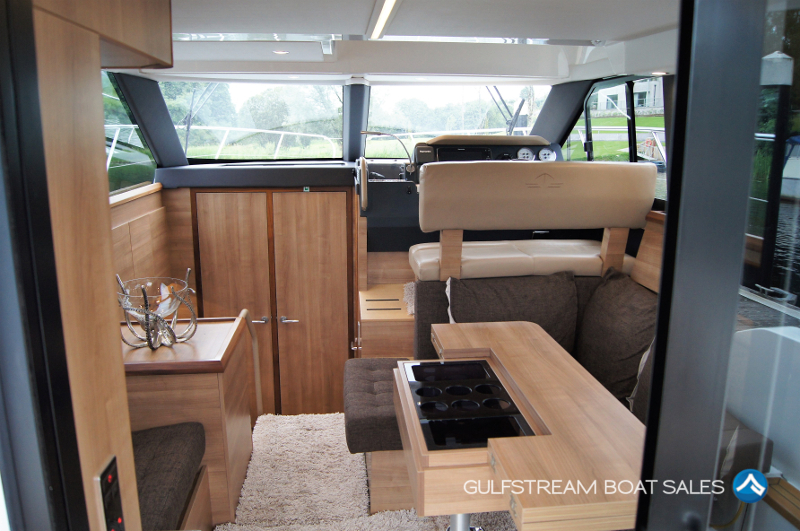 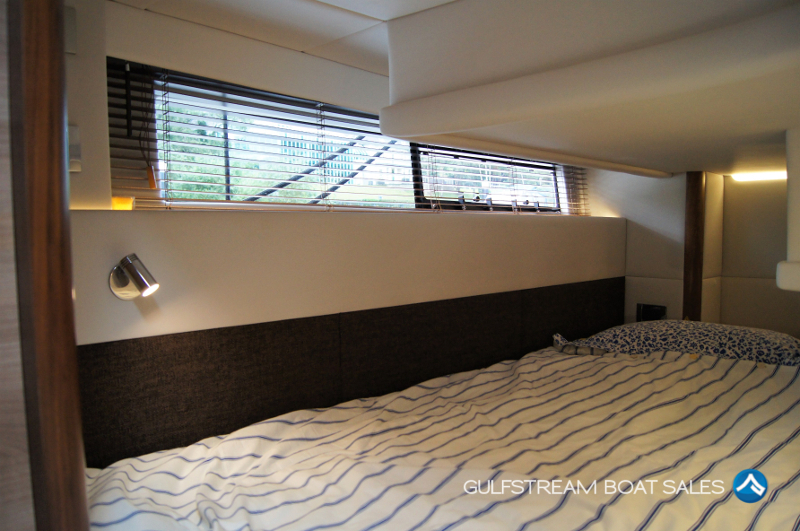 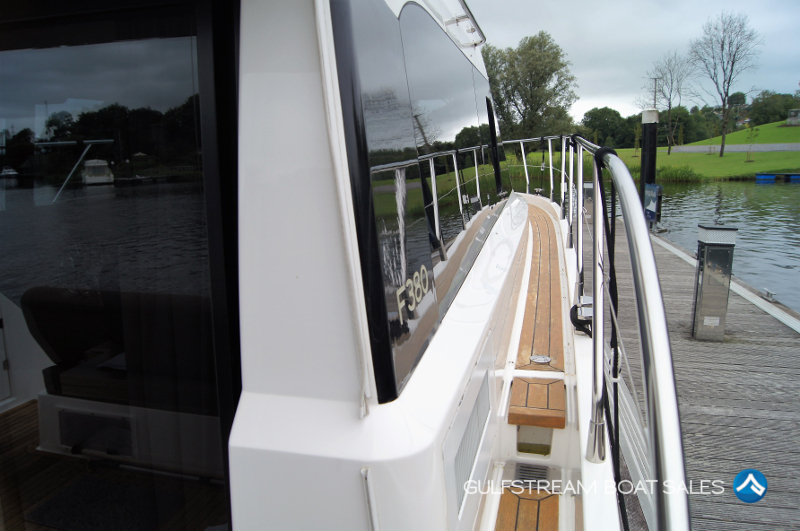 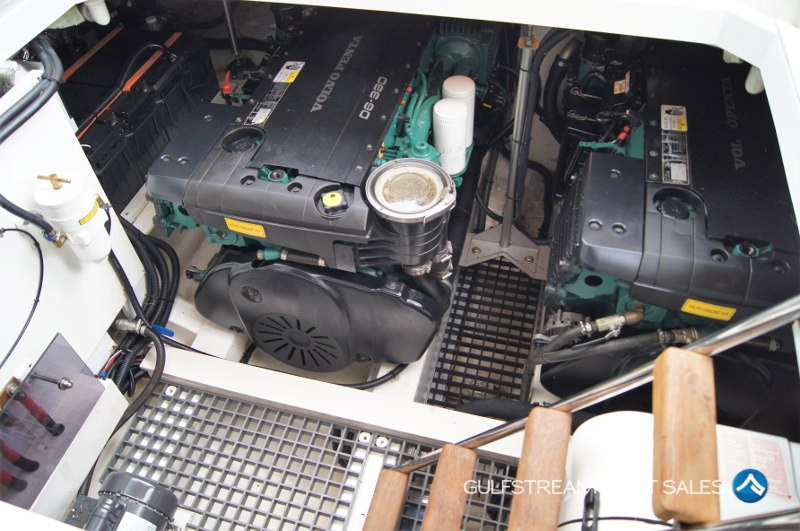 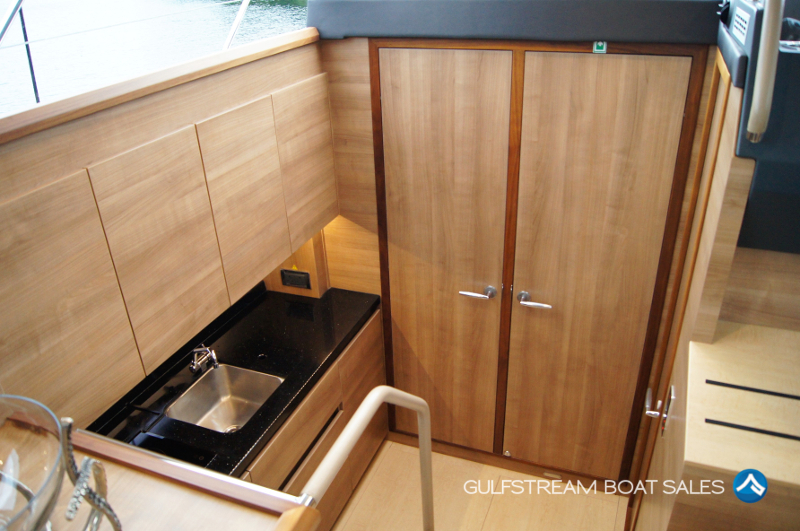 There’s over £100k of extras on this boat and it all looks like brand new. 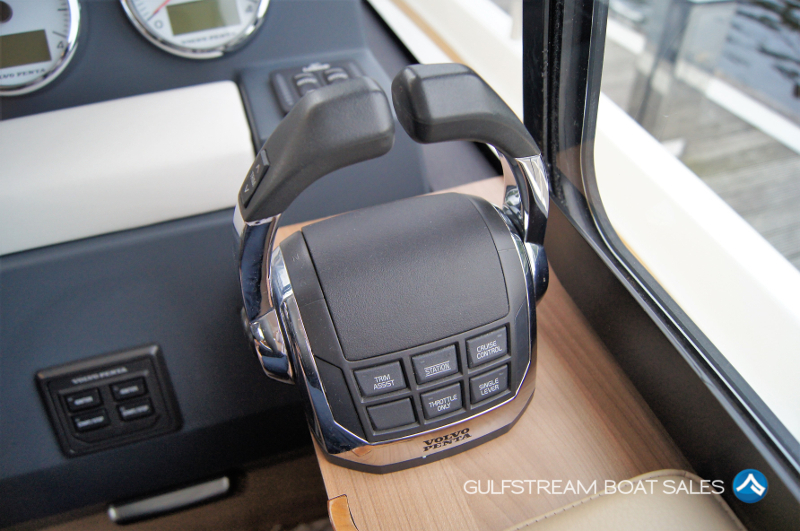 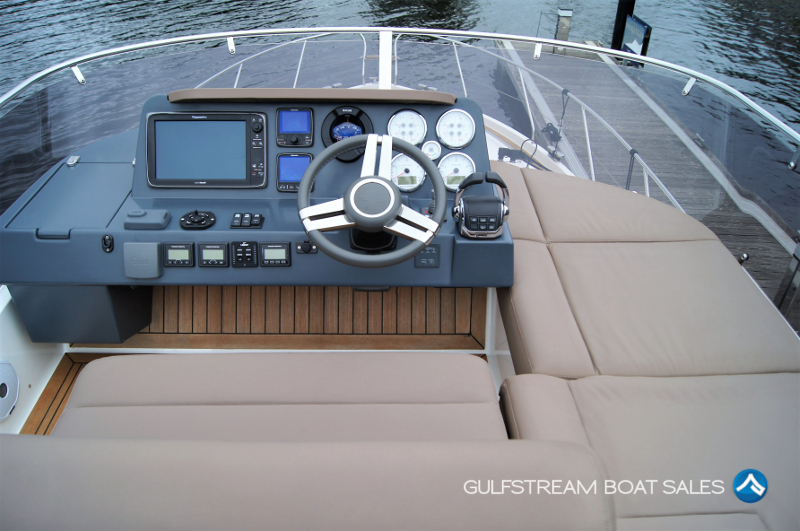 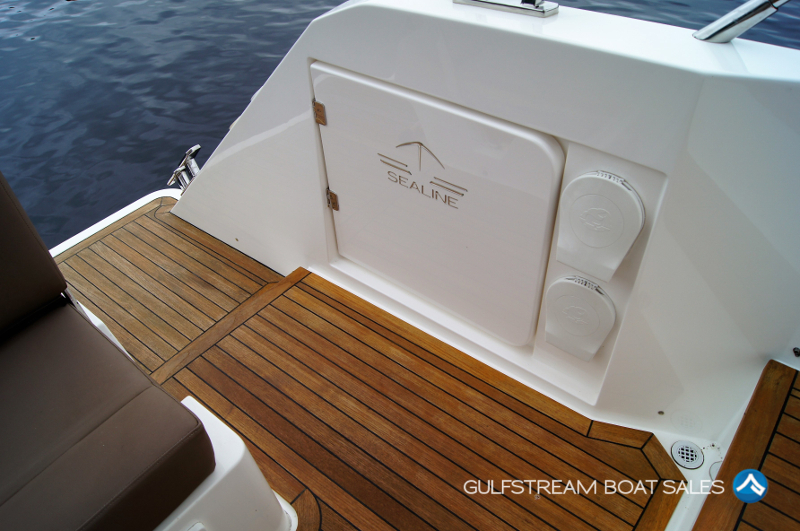 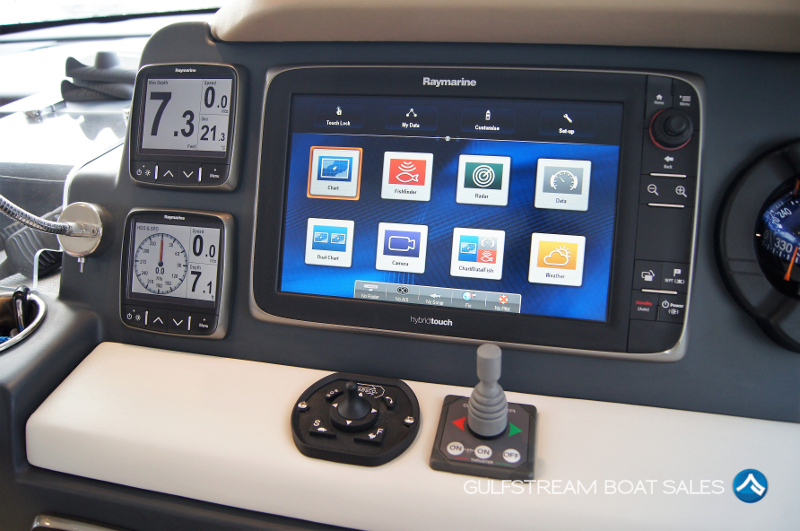 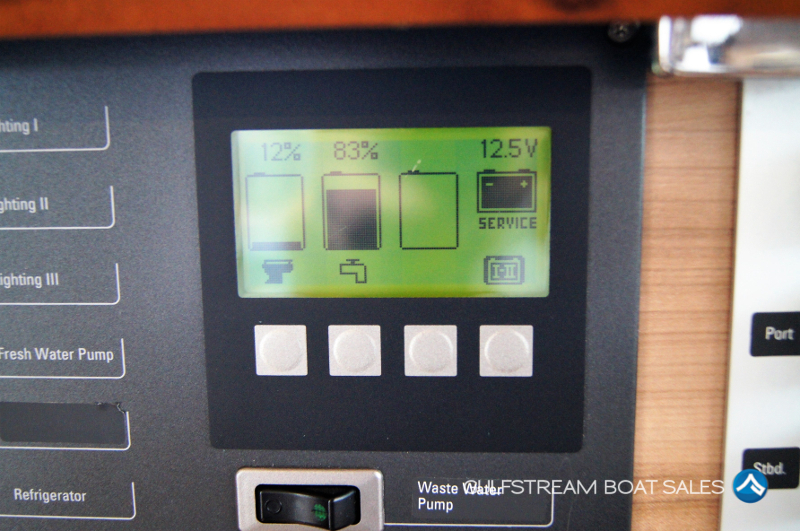 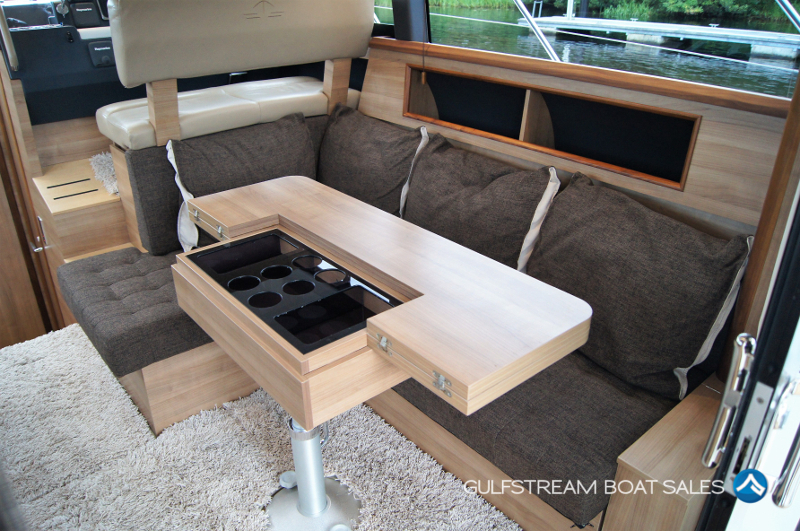 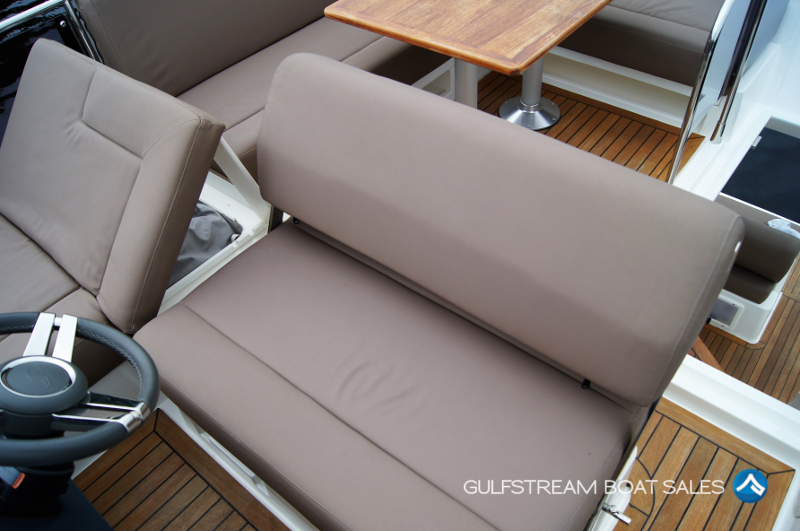 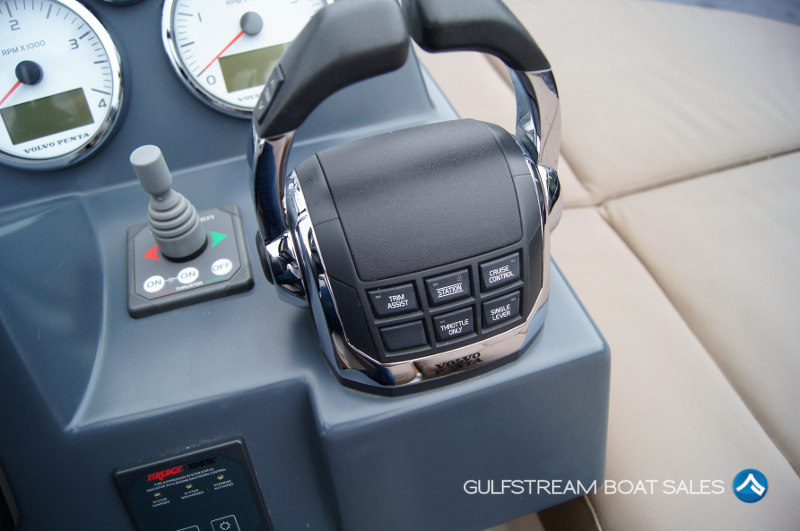 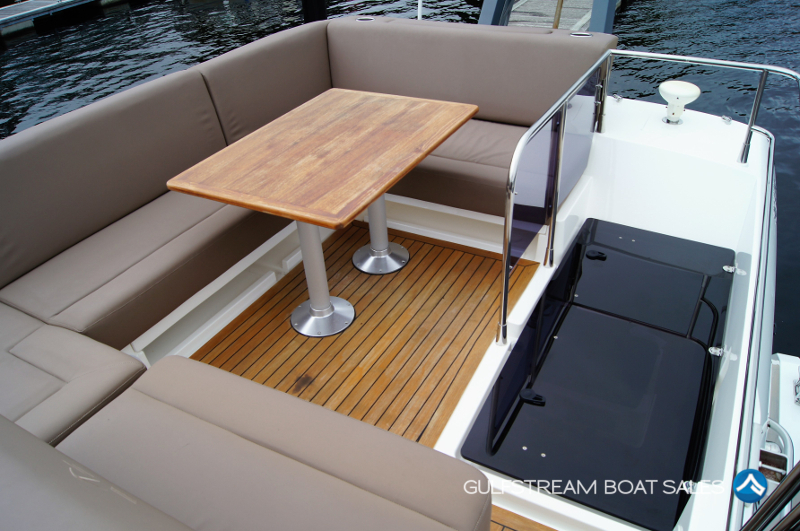 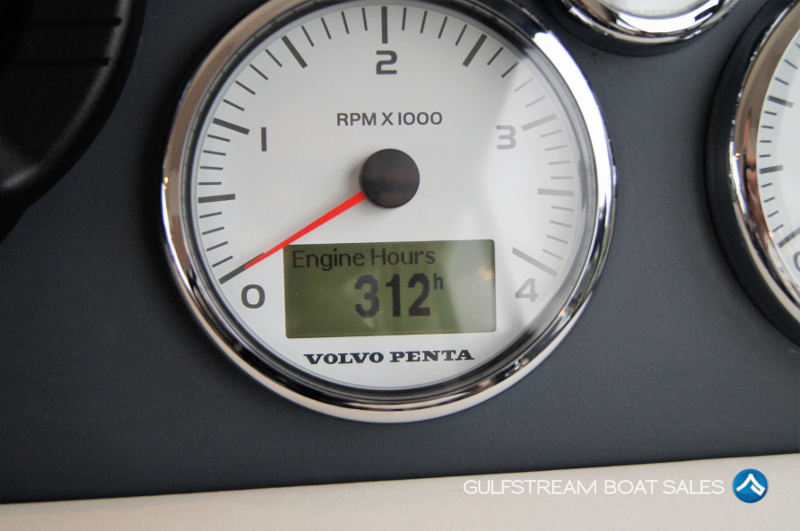 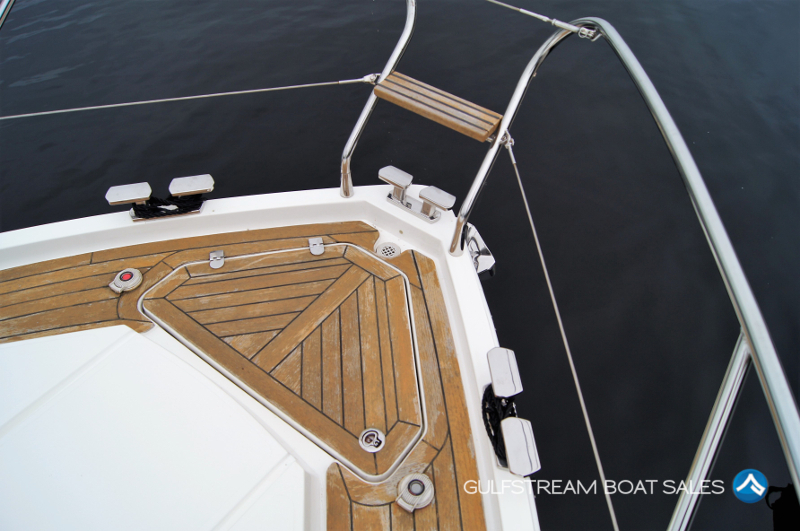 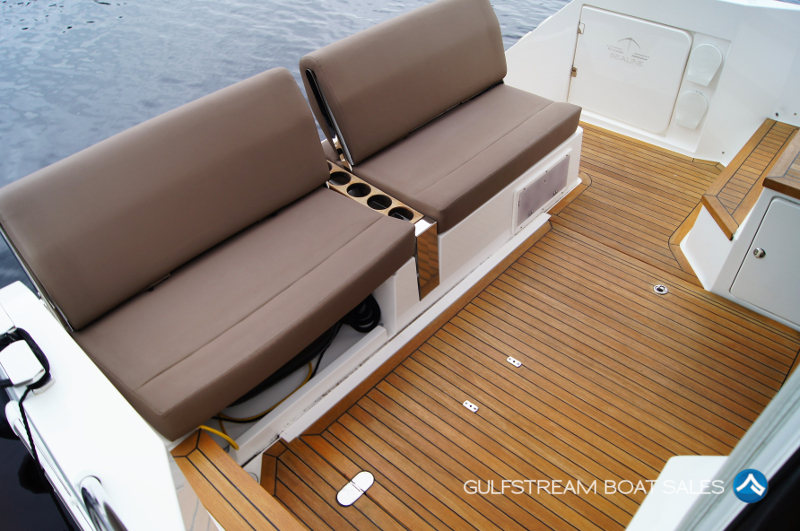 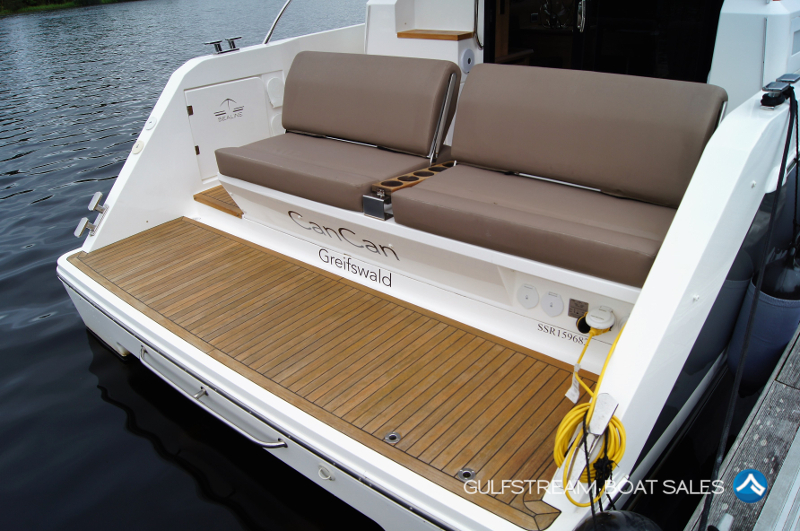 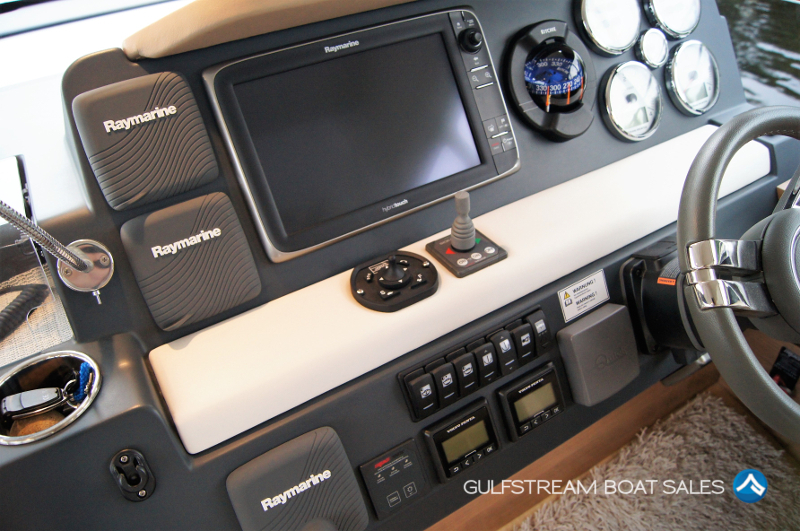 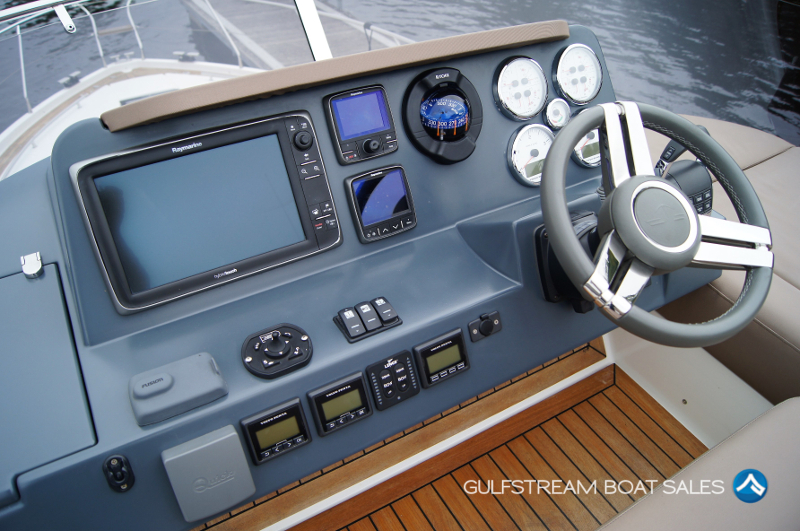 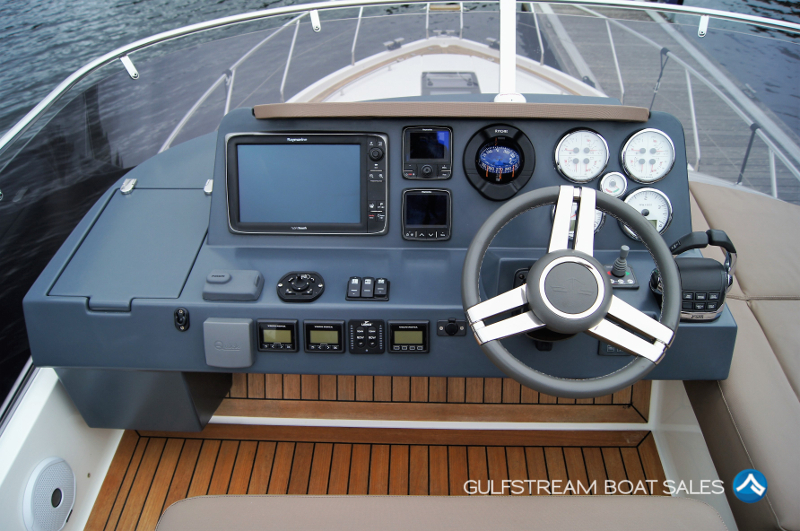 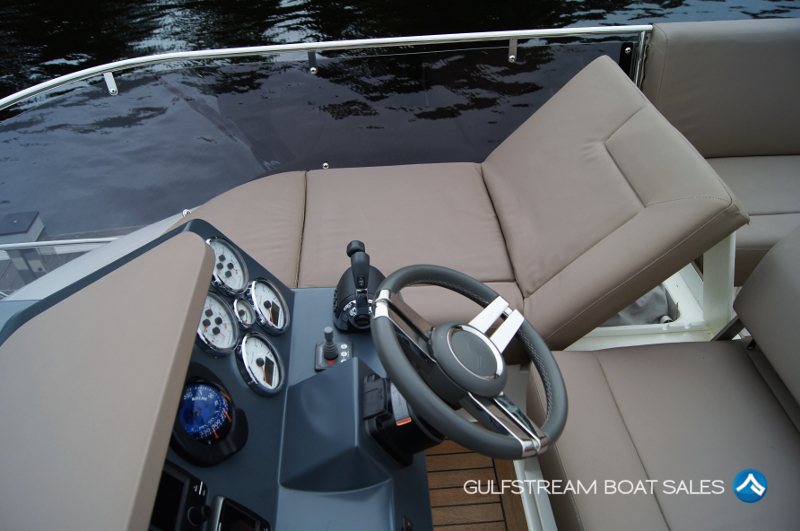 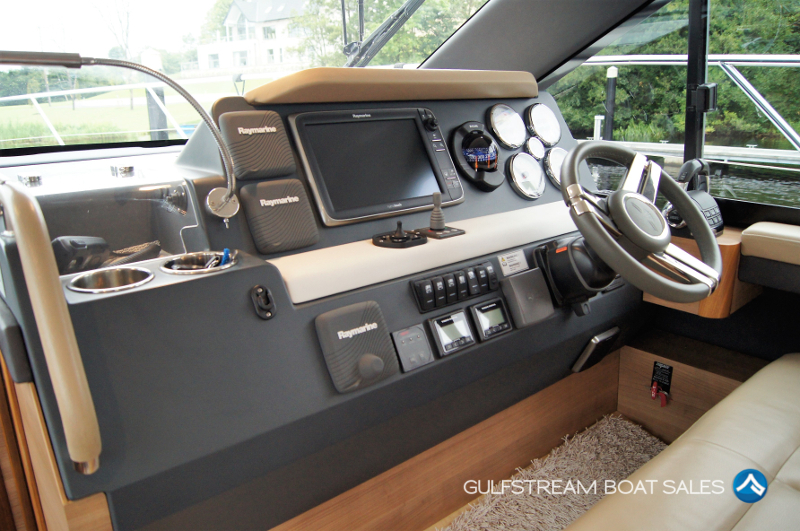 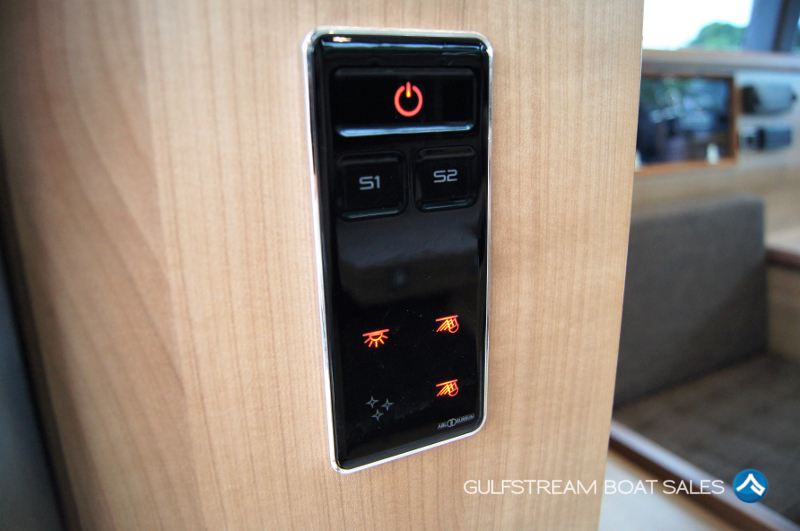 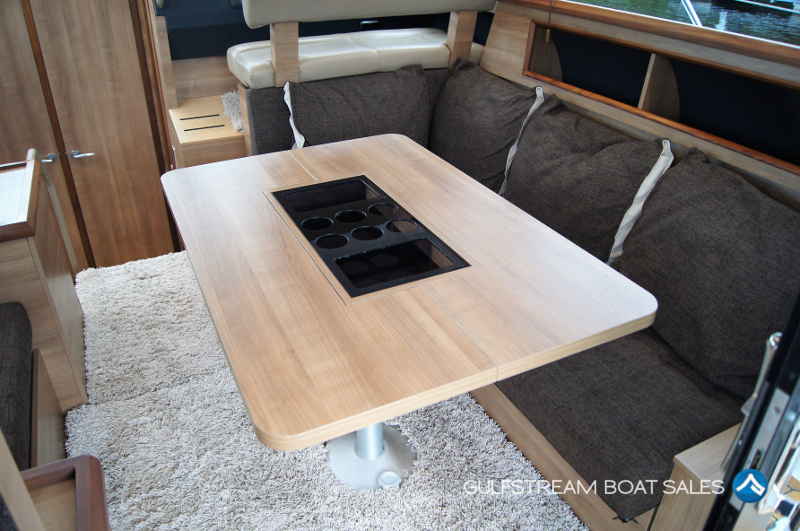 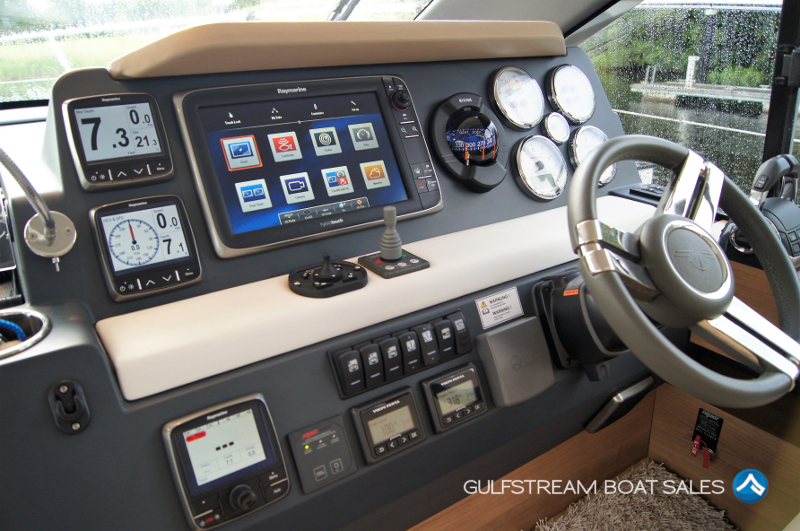 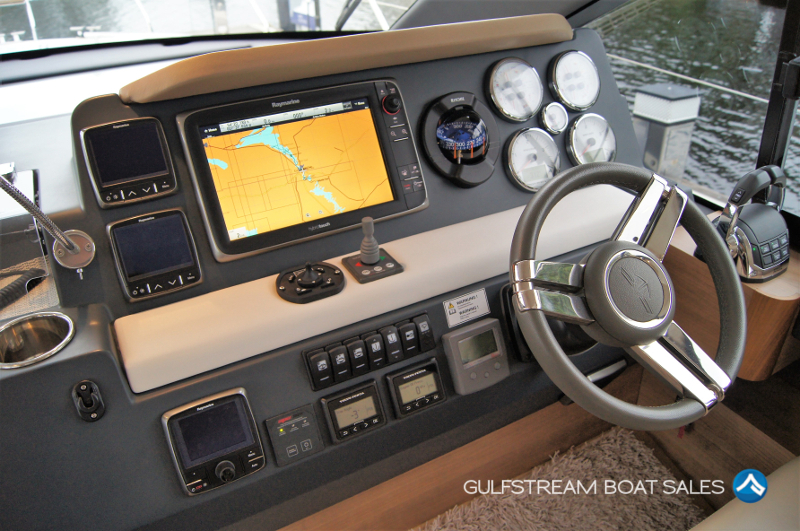 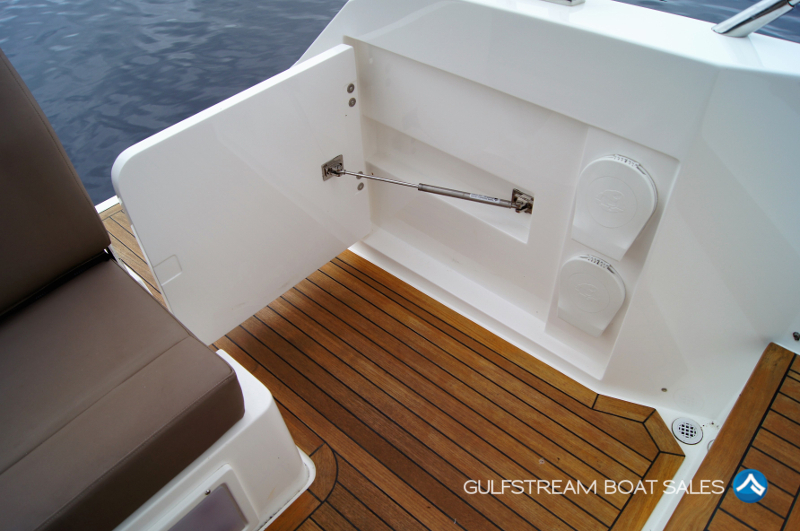 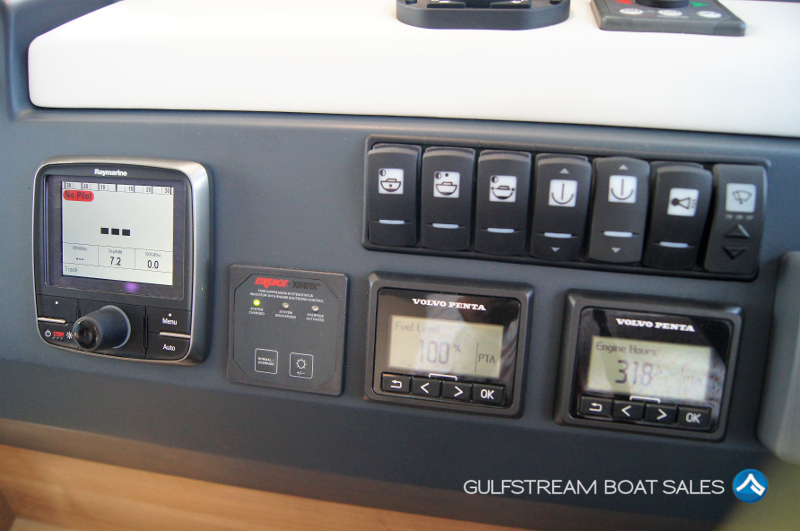 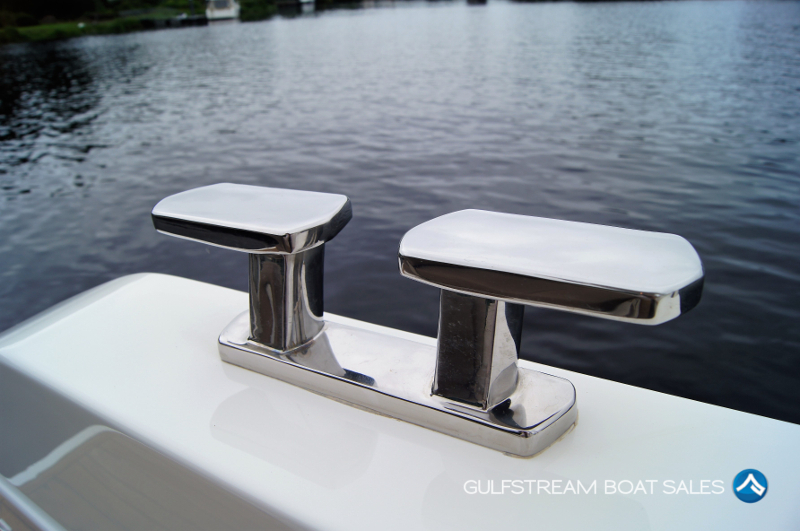 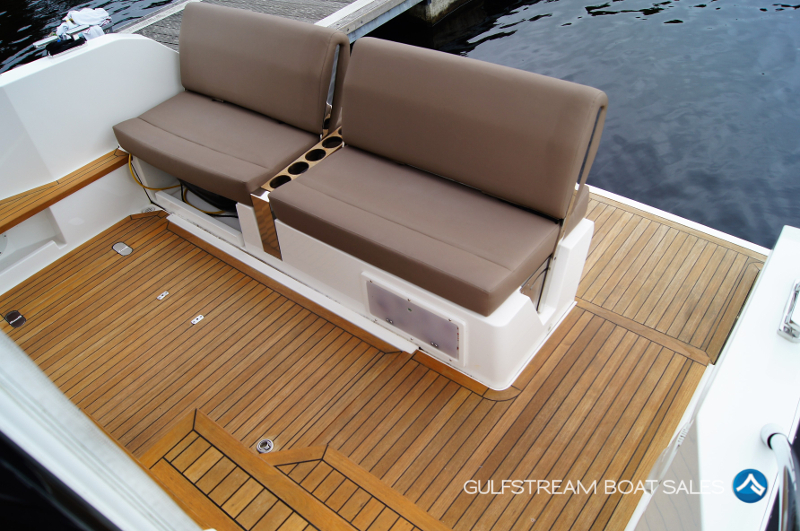 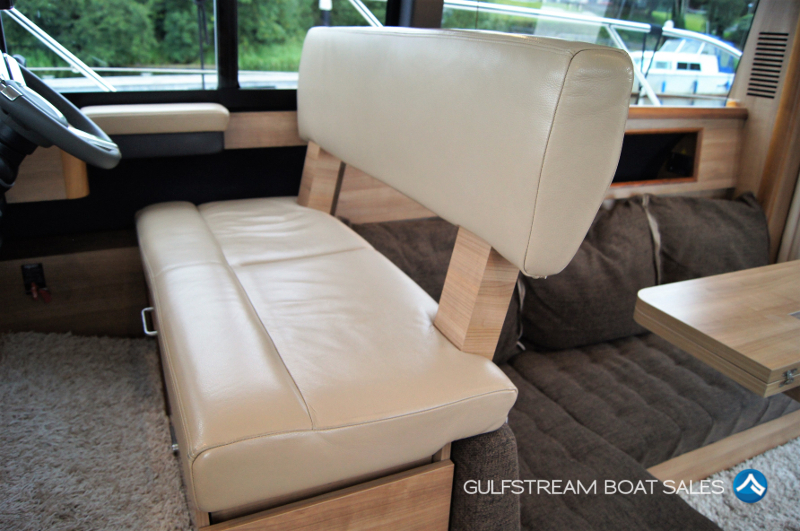 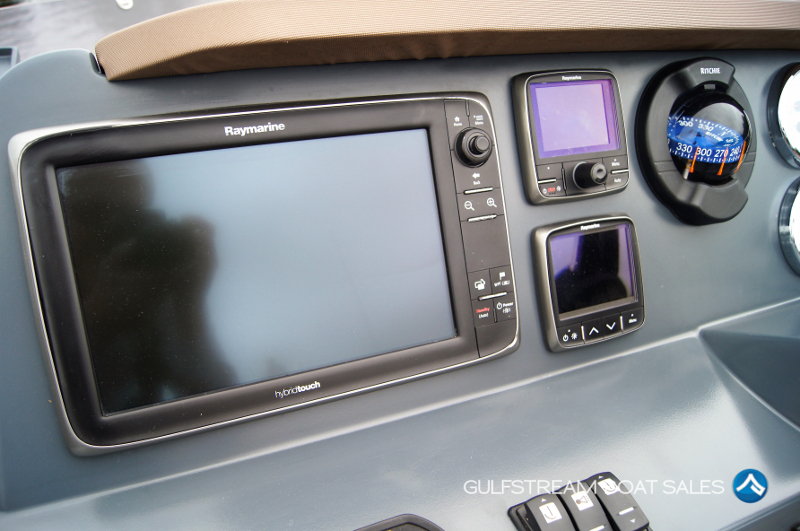 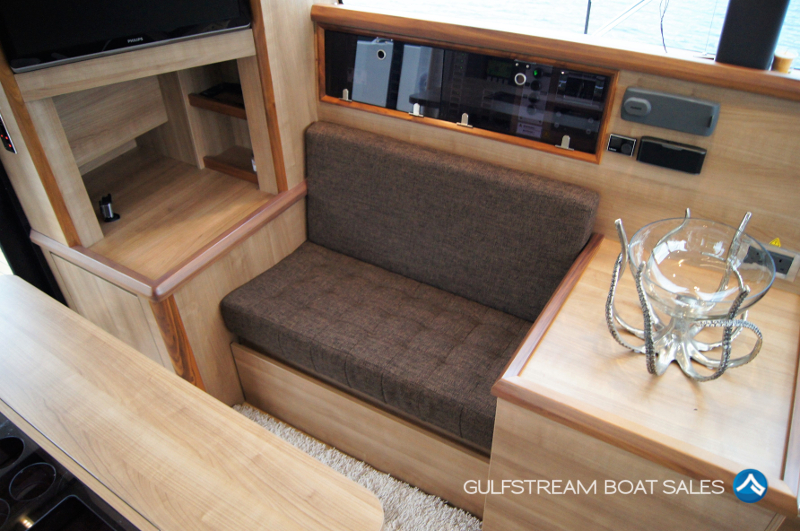 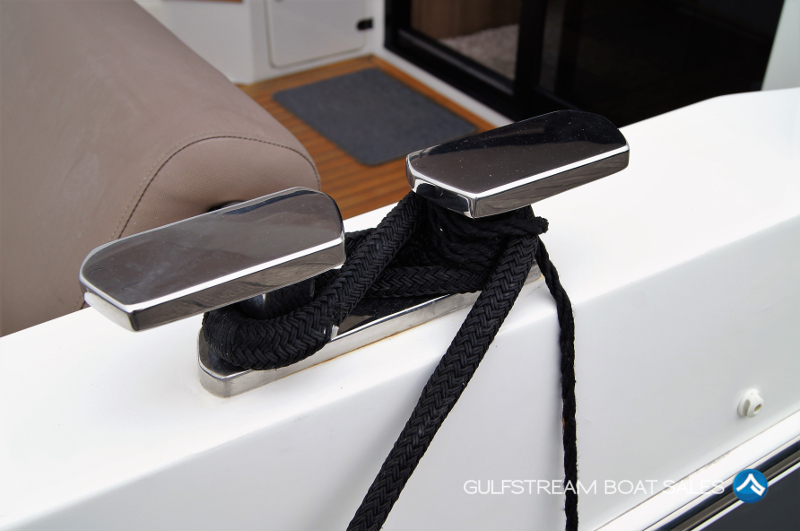 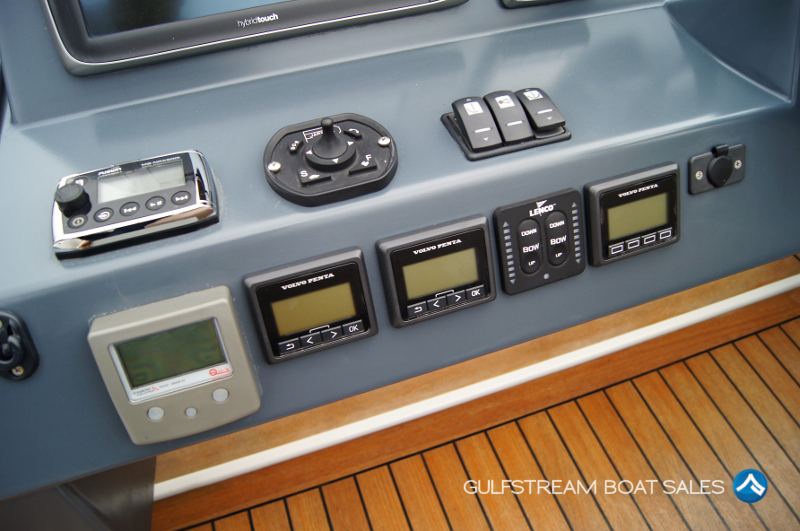 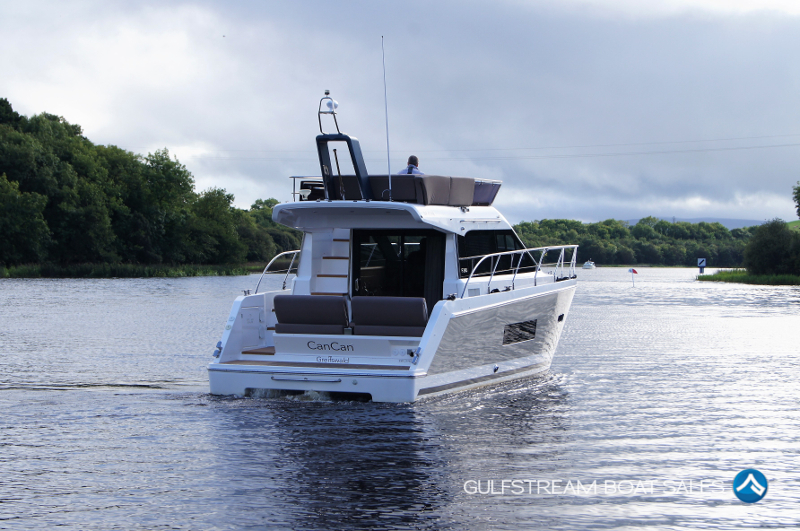 Check out our full video review to see just how nice this boat is. 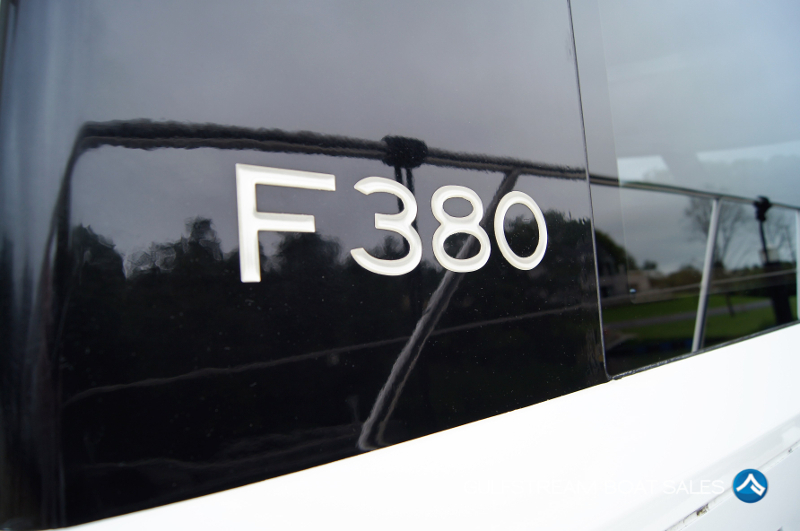 With her stunning Silver Hull wrap, teak decks and upgraded LED lighting package this is the best looking F380 that I have seen. 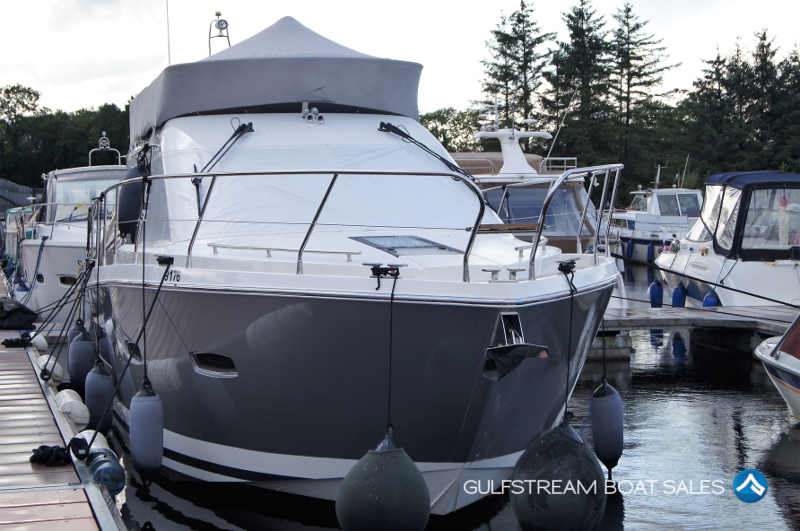 She turns heads and attracts compliments wherever she goes. 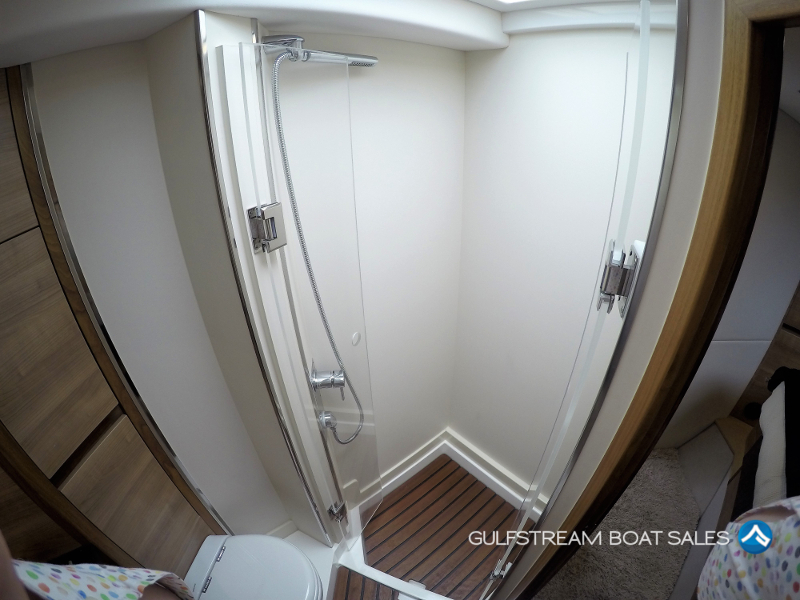 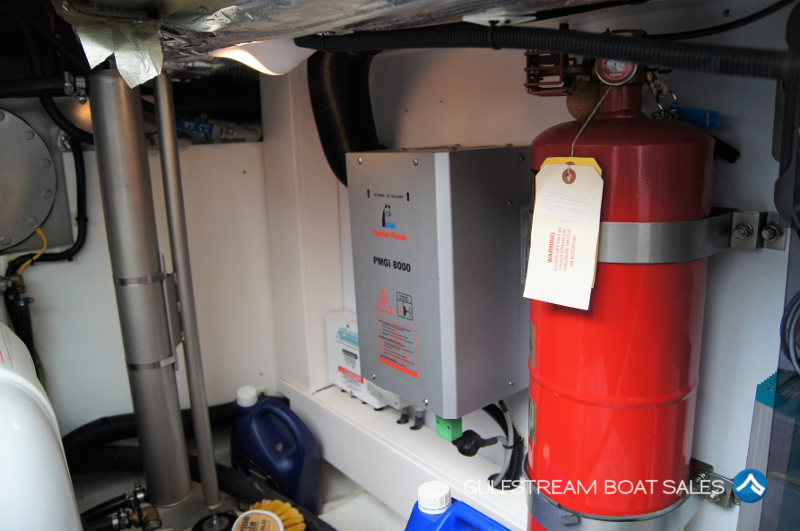 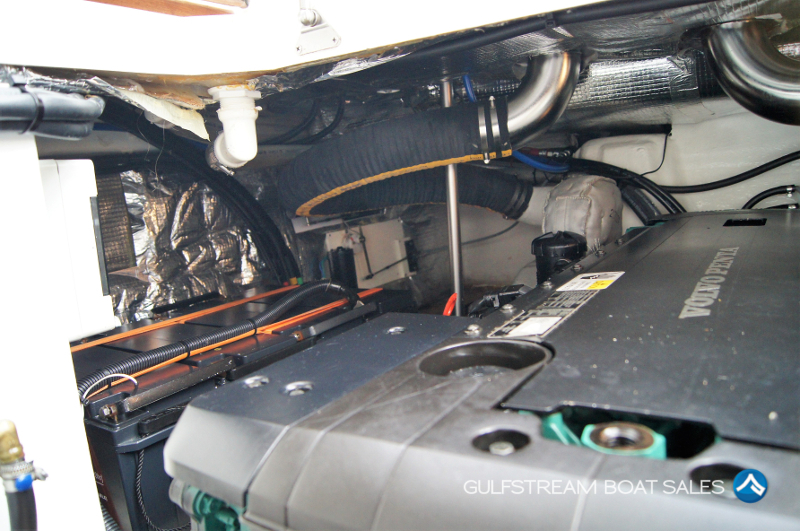 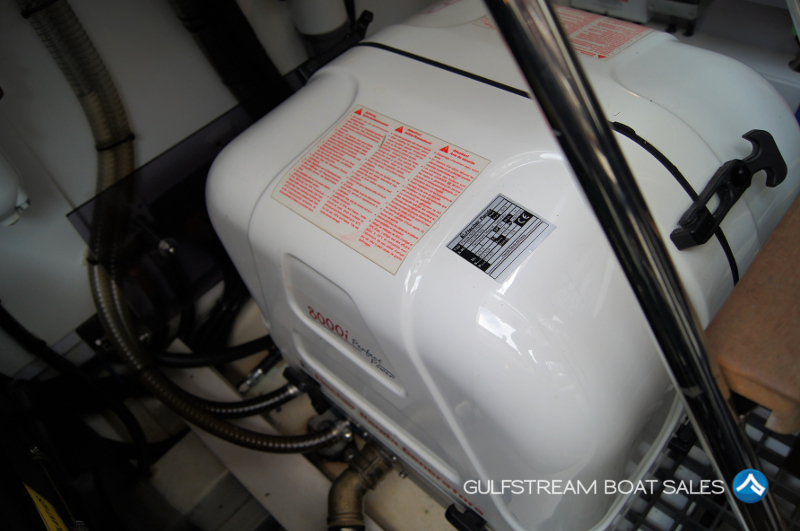 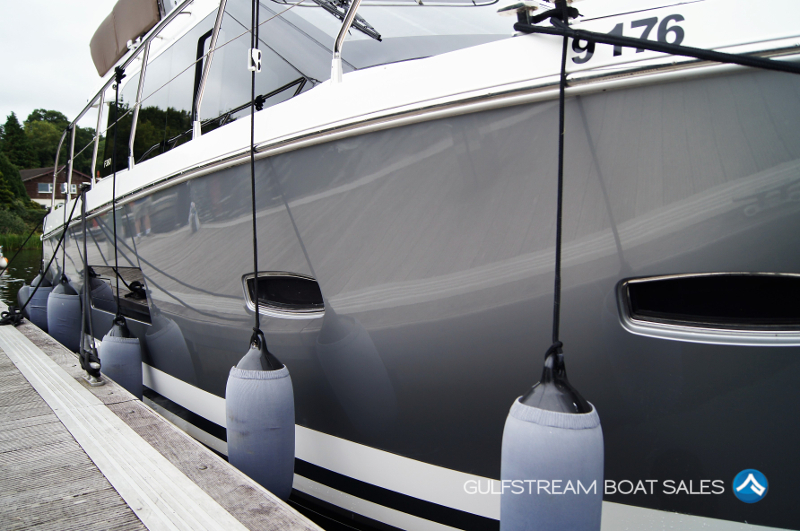 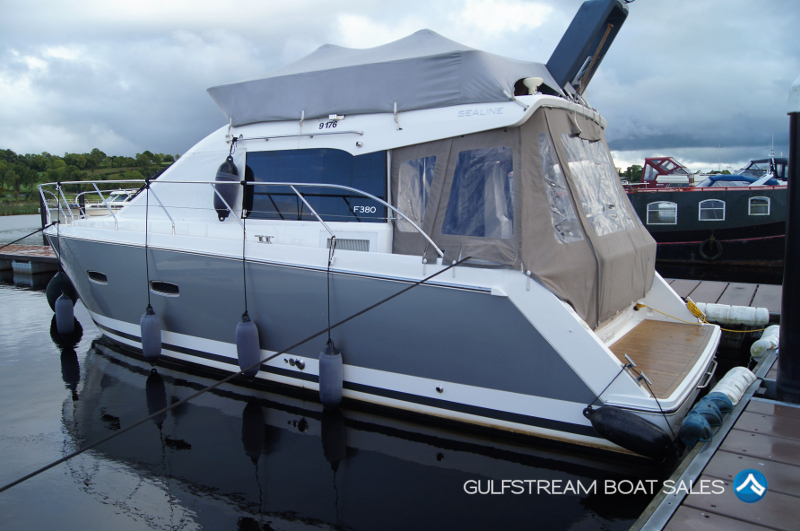 Since being sold the boat has only been used in fresh water (so no salt corrosion issues) by one very careful owner who has never cooked onboard and is extremely particular about the up-keep and maintenance of the boat. 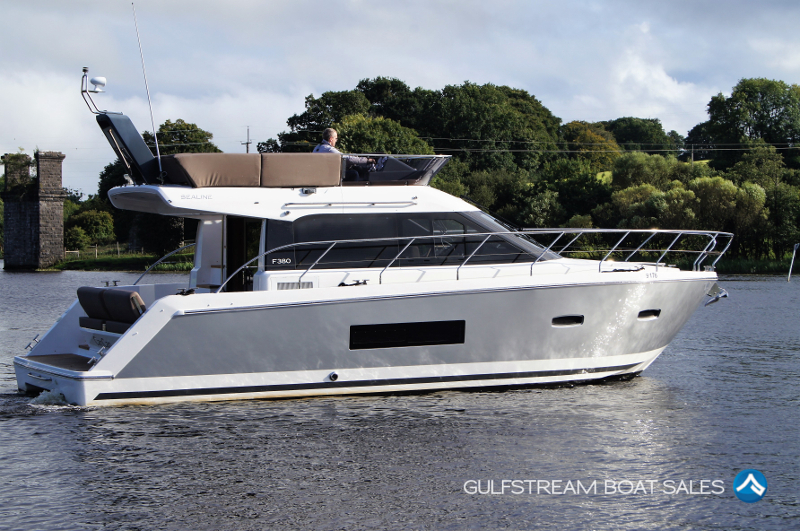 I think she has to be the best example on the market. 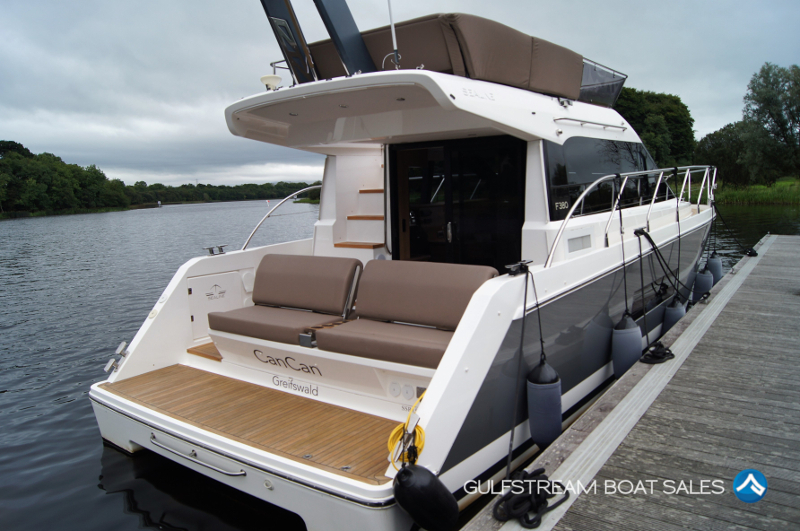 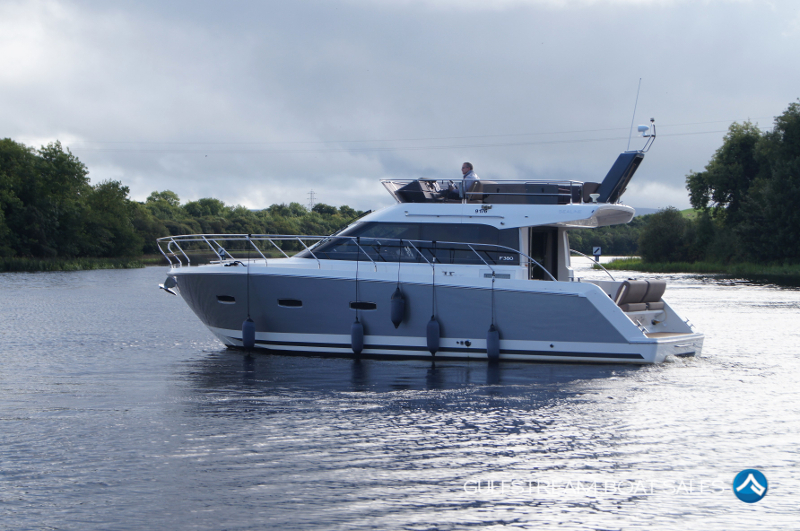 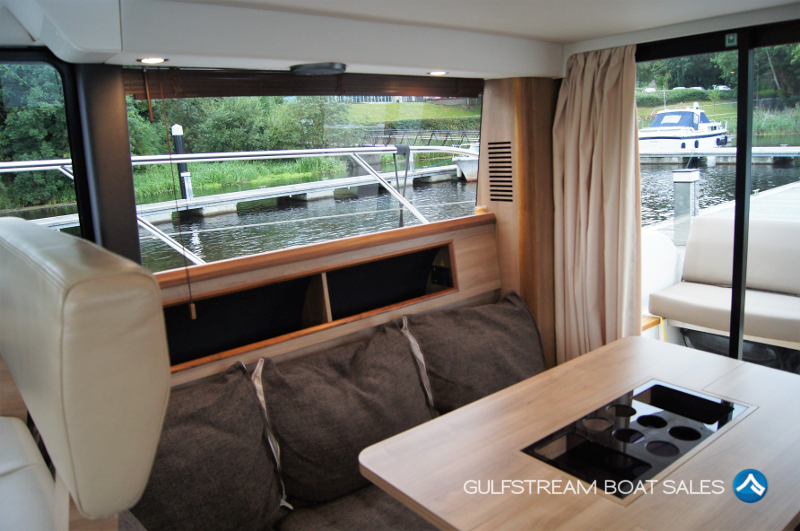 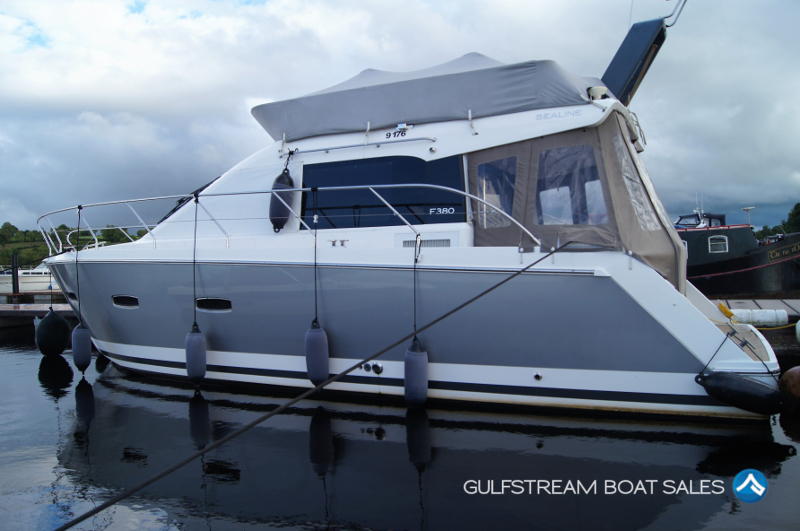 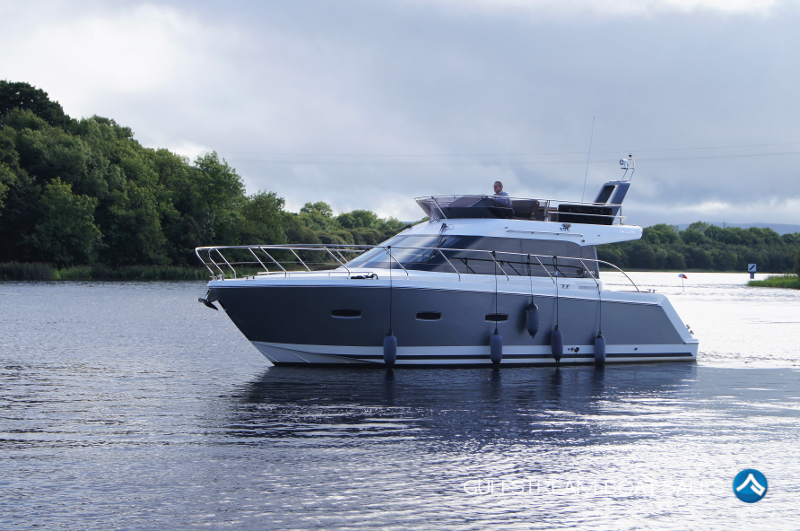 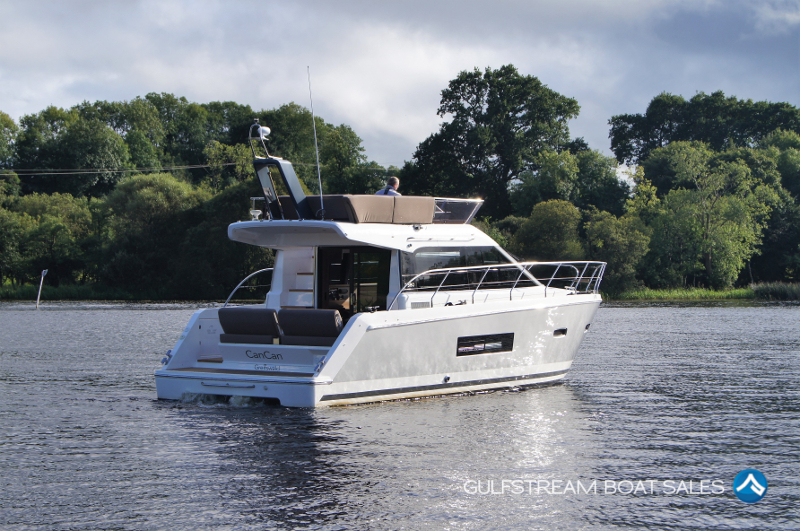 If you’re looking for a Sealine F380 or generally a stylish 40-foot flyrbidge cruiser in immaculate condition, then this boat is well worth a look. 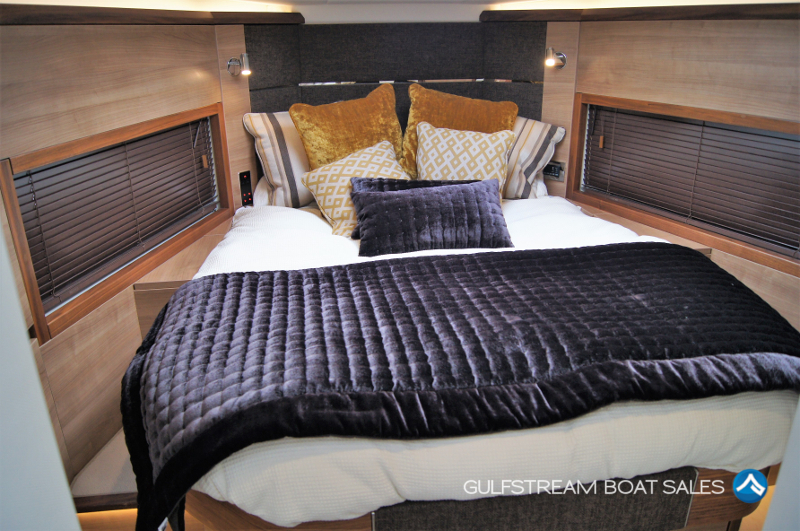 Check out our full length video tour to get all the details. 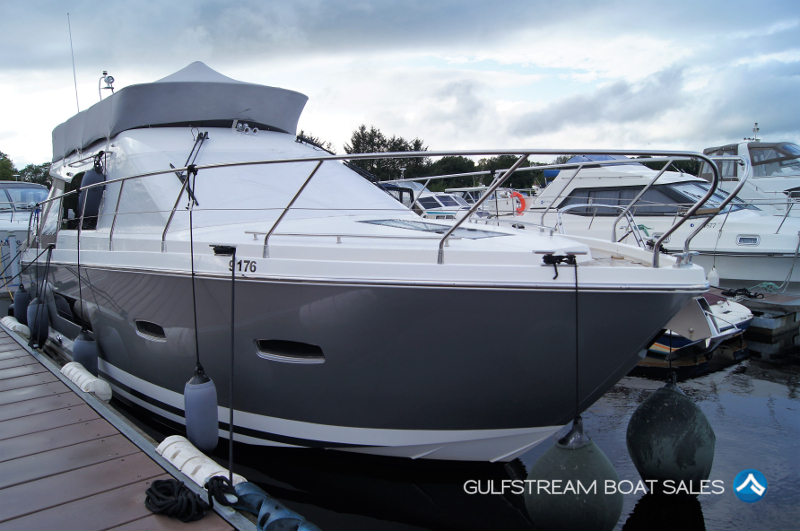 We specialise in selling boats at a distance, so if you need help with moving this boat to your home berth in the UK, or further afield, we can arrange everything for you. 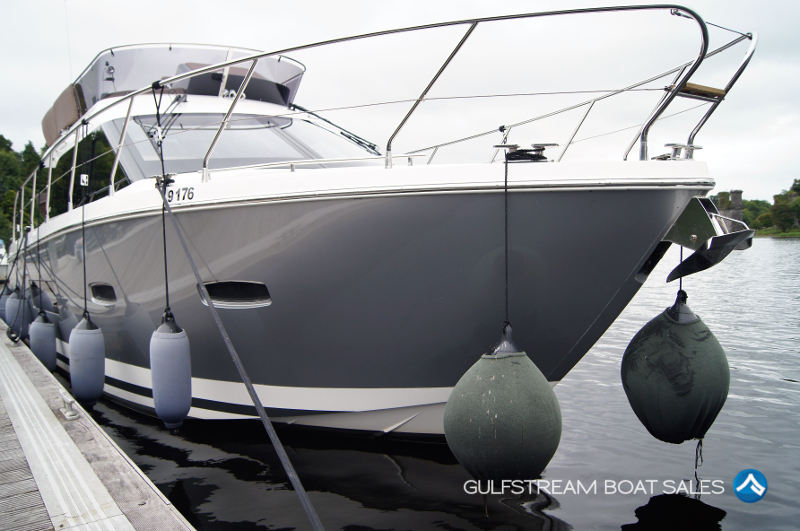 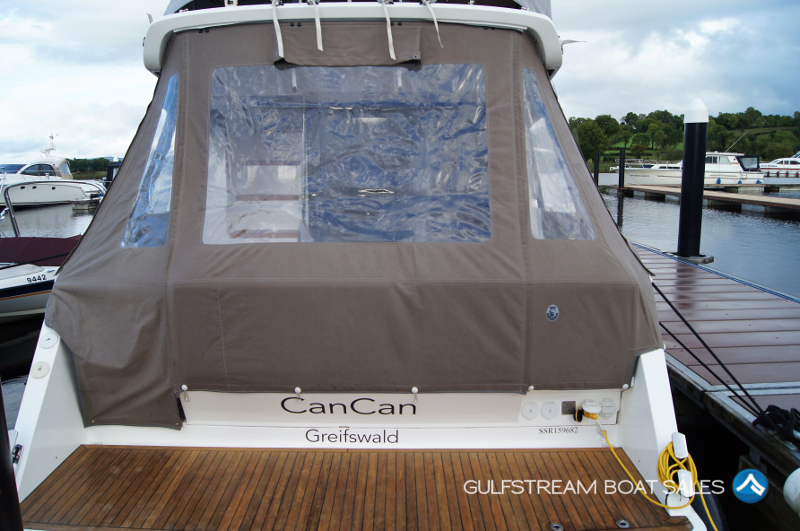 We are also happy to consider a part exchange if you have a boat that you would like to trade in. 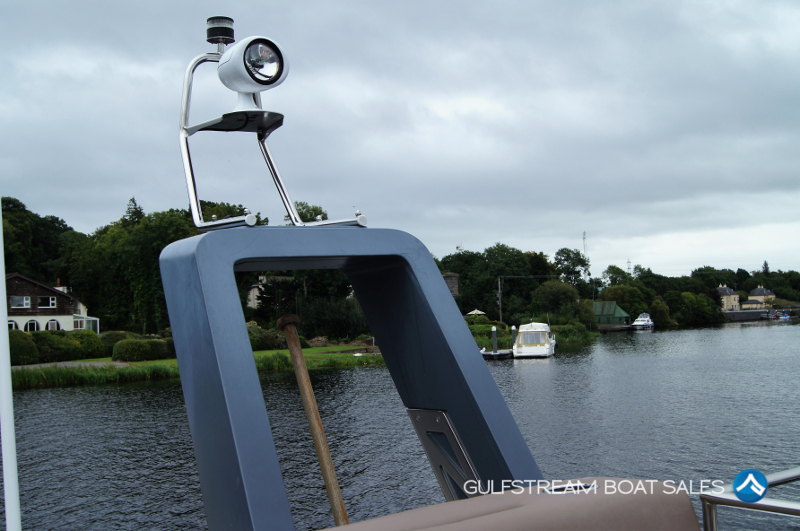 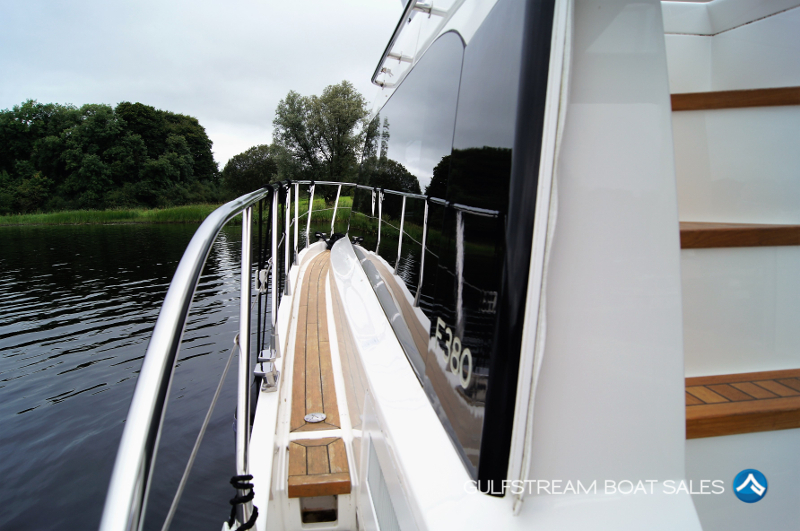 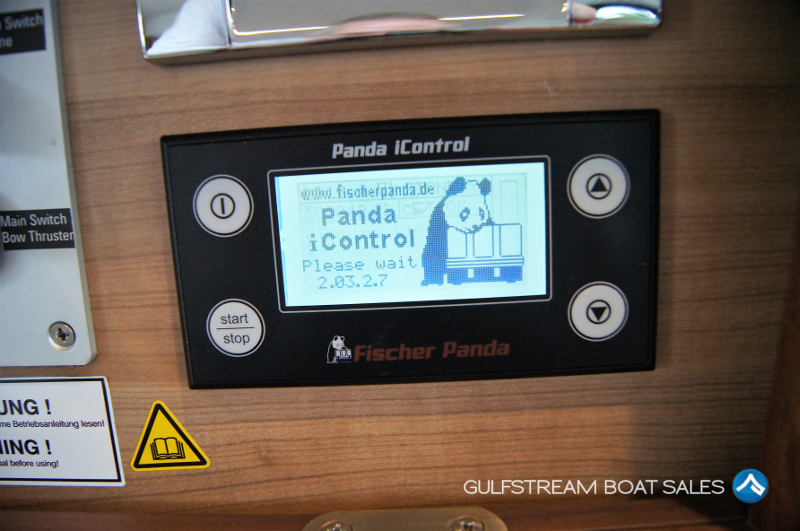 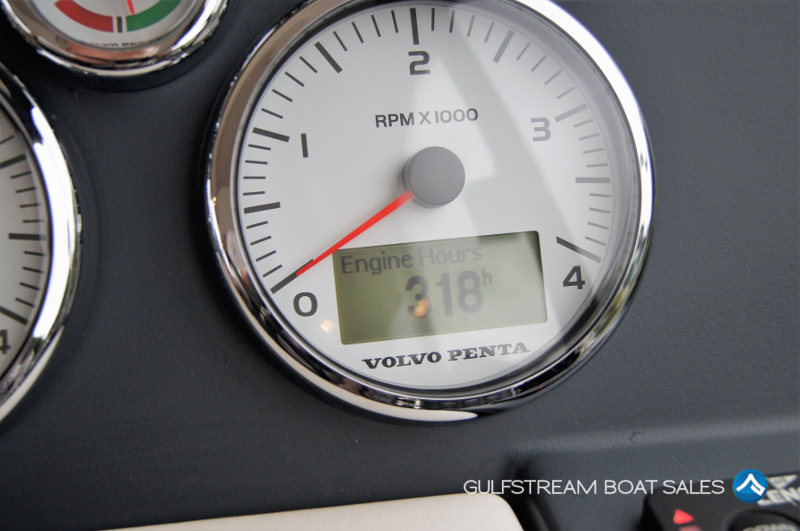 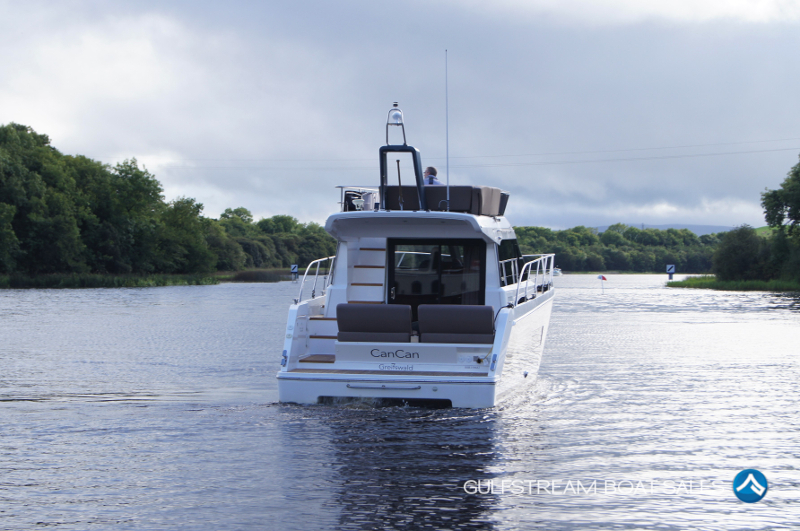 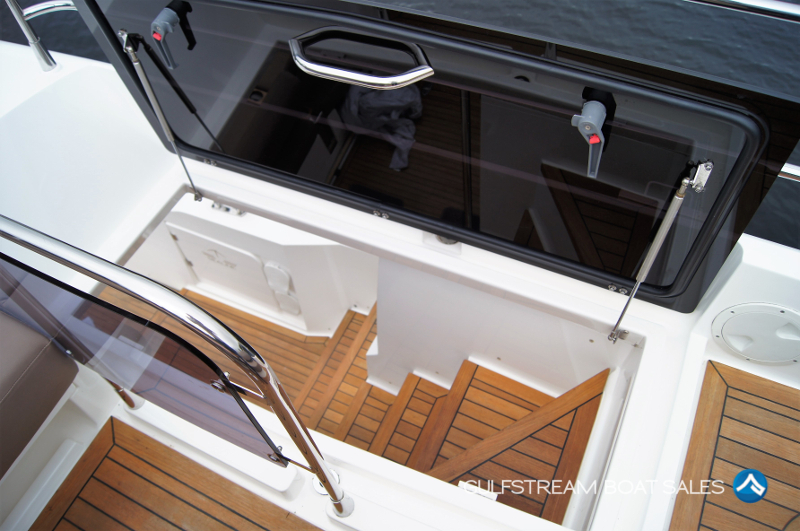 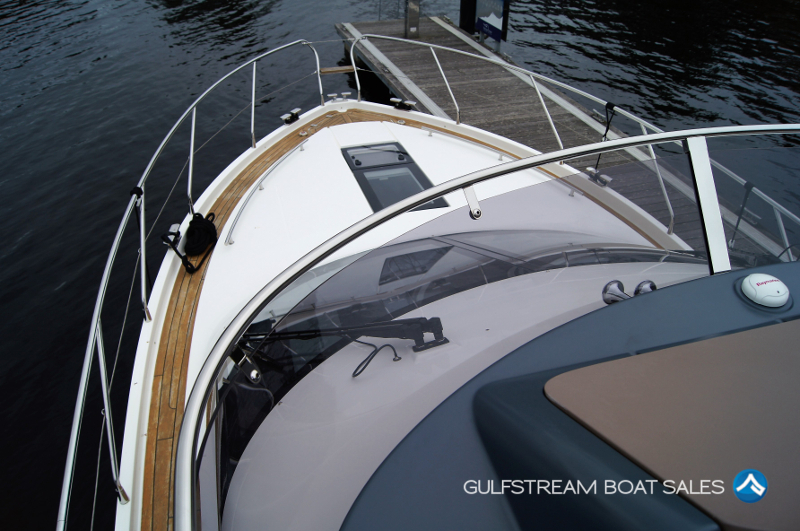 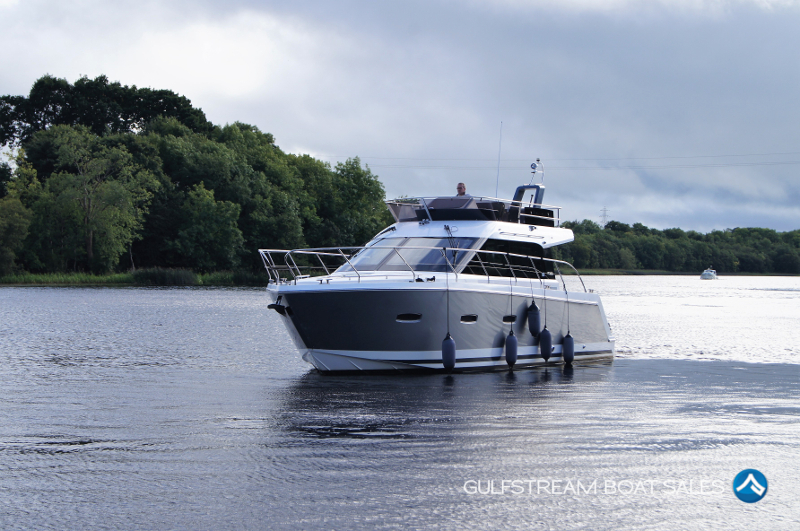 Sign up for VIP access and watch our full hour long video tour and familiarise yourself with just good this boat is. 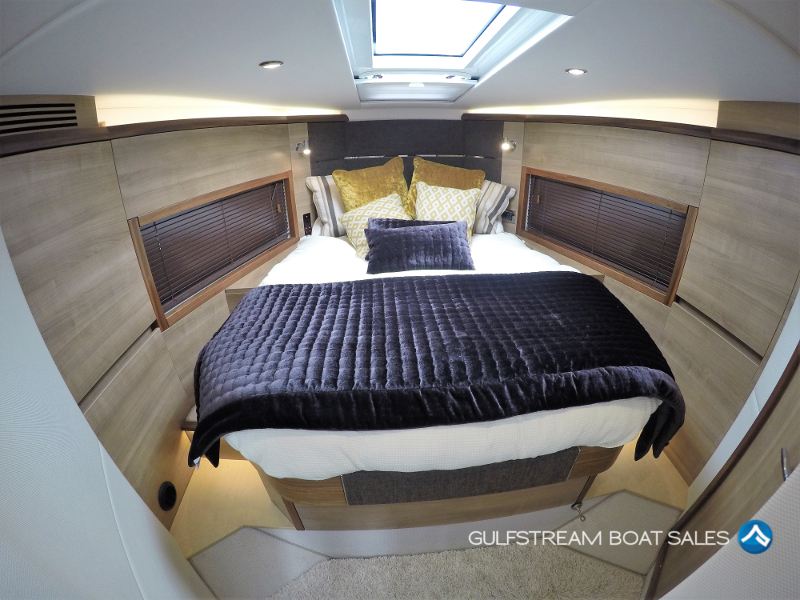 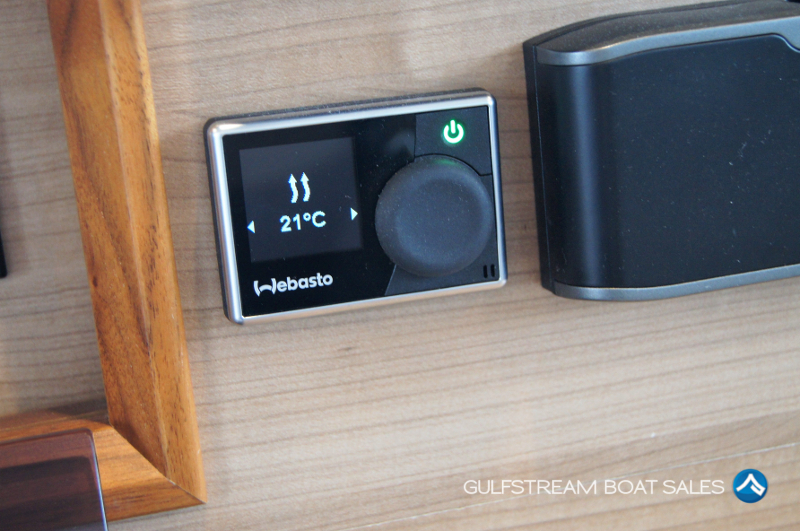 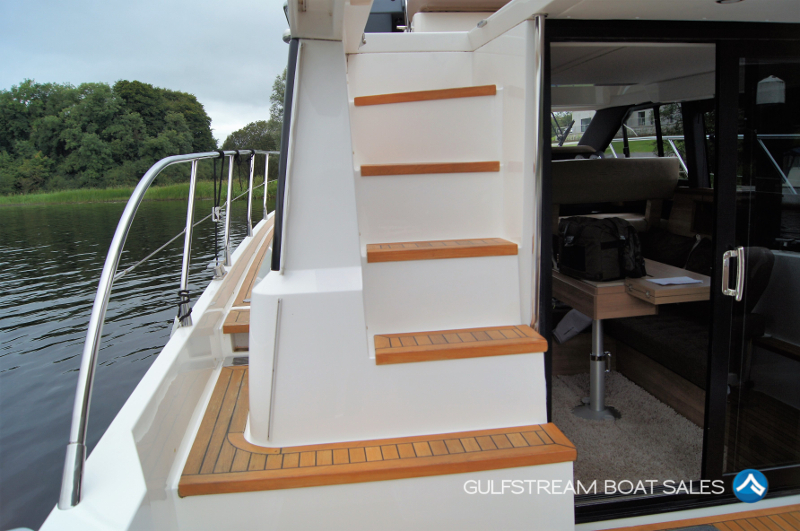 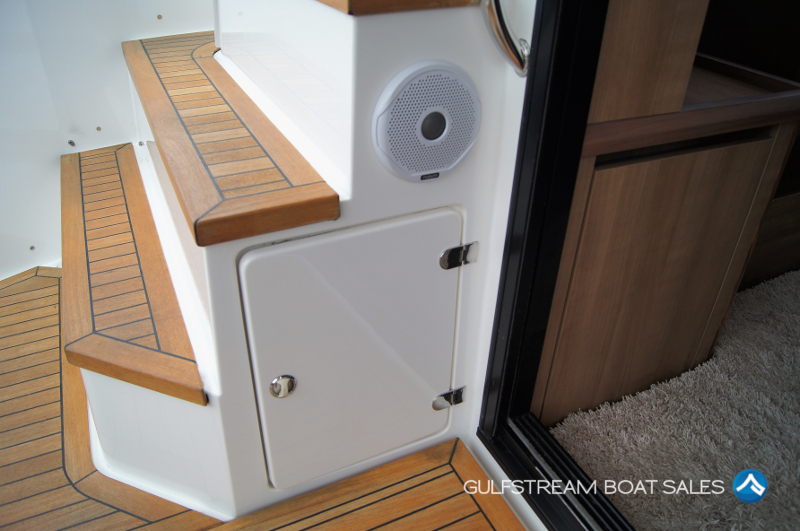 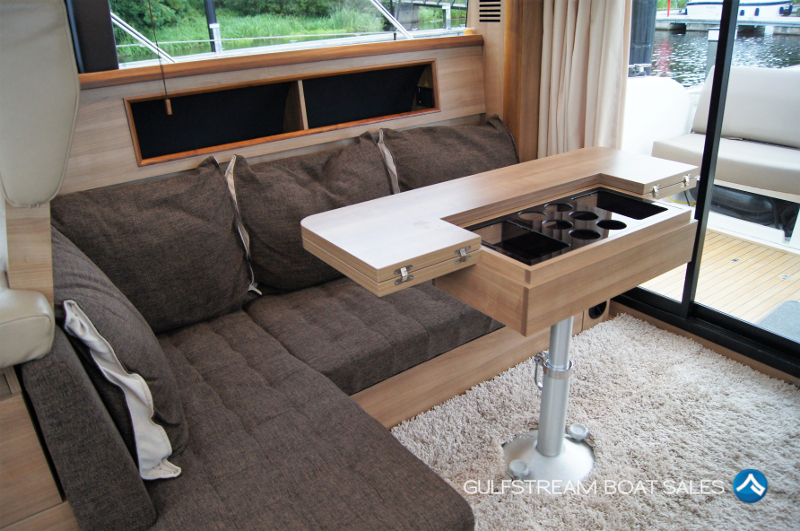 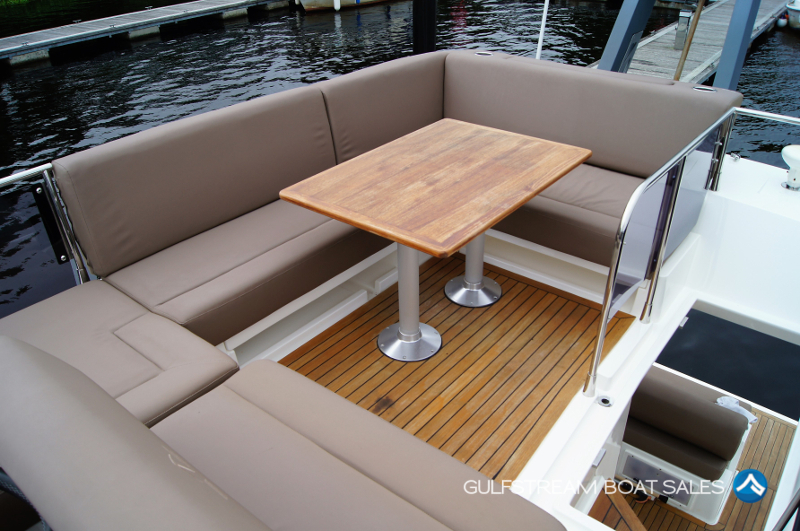 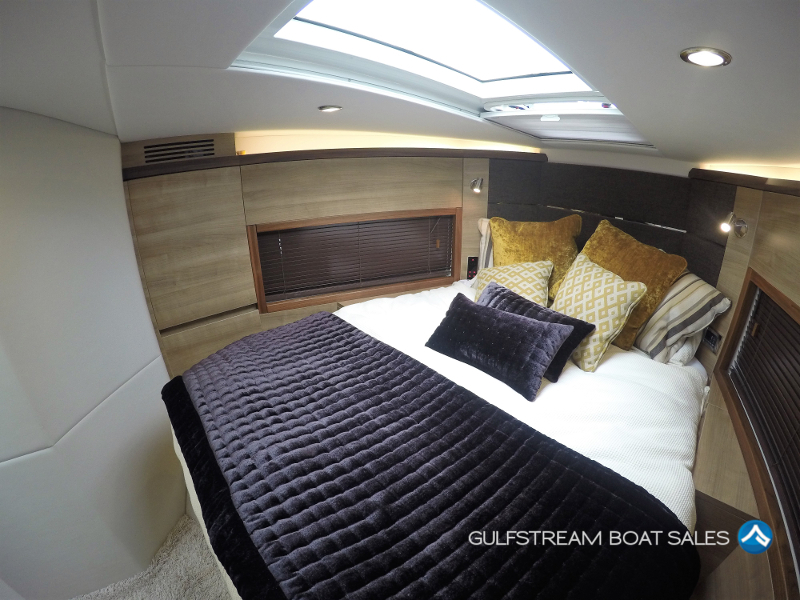 To get the full low down on the boat please watch our full length video tour – just sign up for FREE VIP Access to see it. 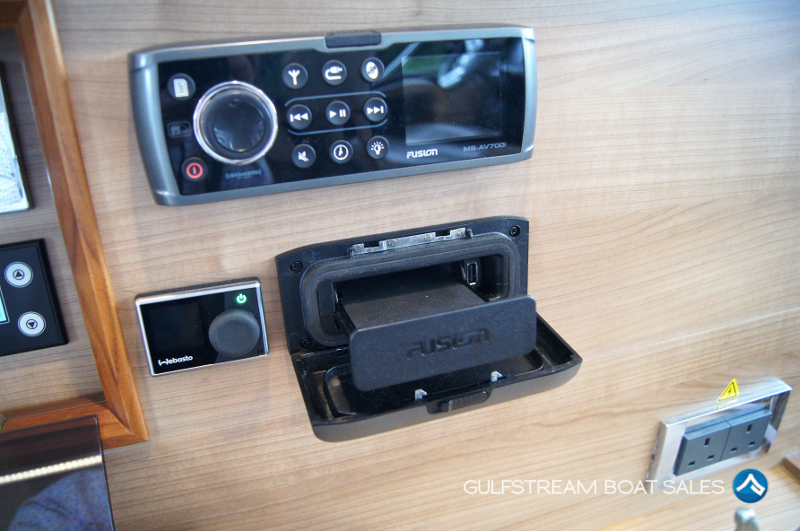 Full Fusion Sound System with AV700i Bluetooth head unit and Ipod/Android/USB Docking Station. 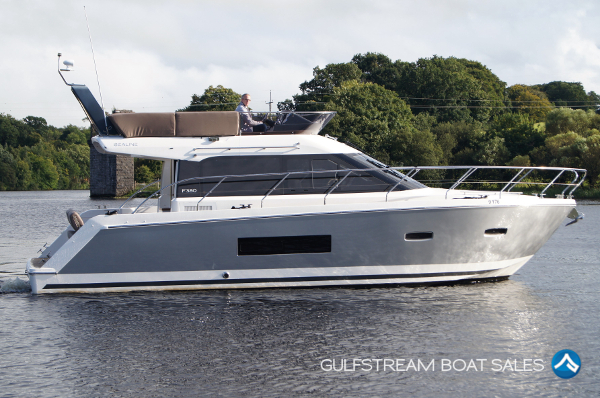 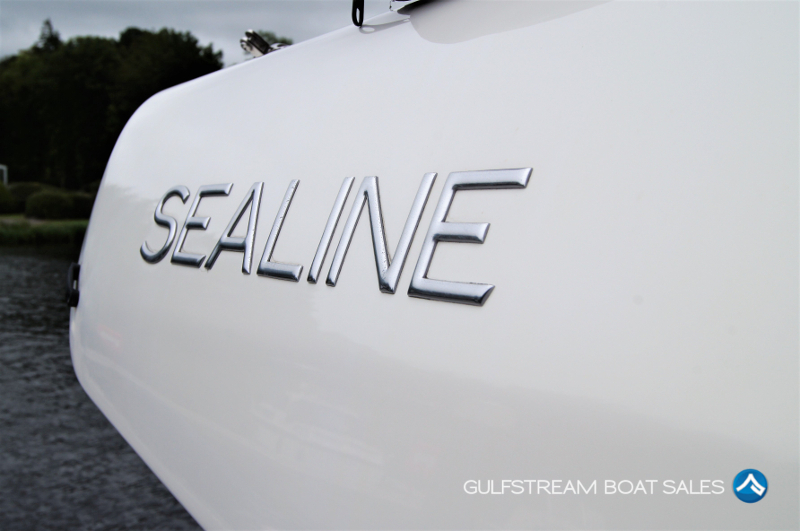 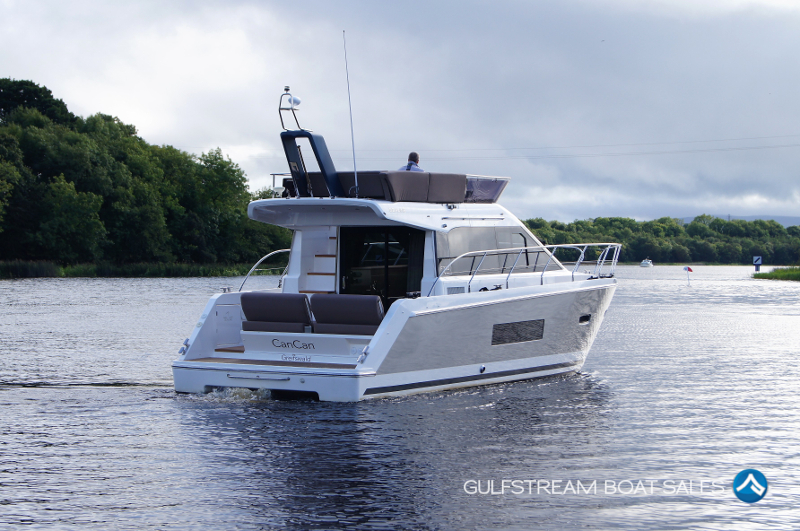 Watch the preview video for this Sealine F380 For Sale on our YouTube channel and check out our past reviews – we’ve got tons of great videos for all our boats currently available plus plenty of tips and advice for boat-owners. 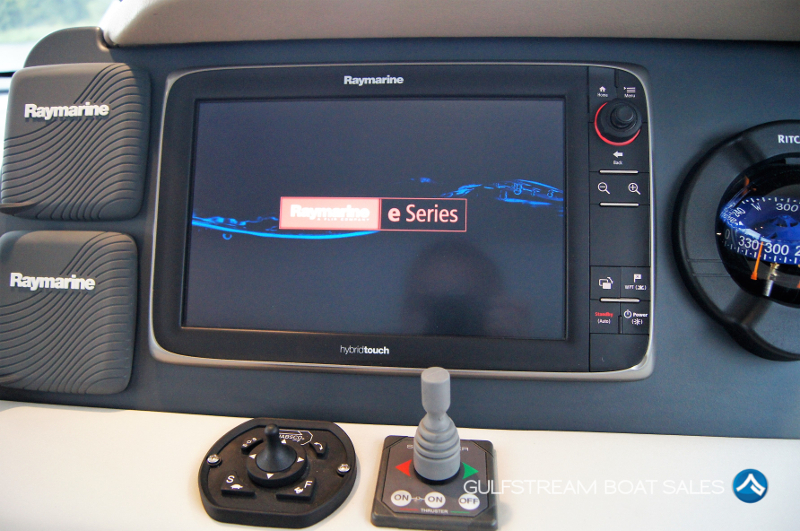 Subscribe to our Channel now and we’ll let you know as soon as a new review is live! 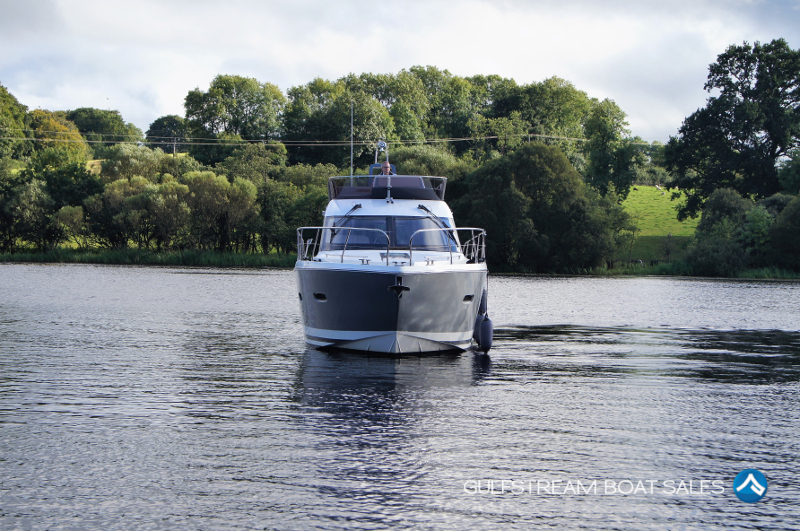 Everything went brilliantly with the pick-up of the boat, Owen was brilliant and spent around an hour taking my brothers through everything. 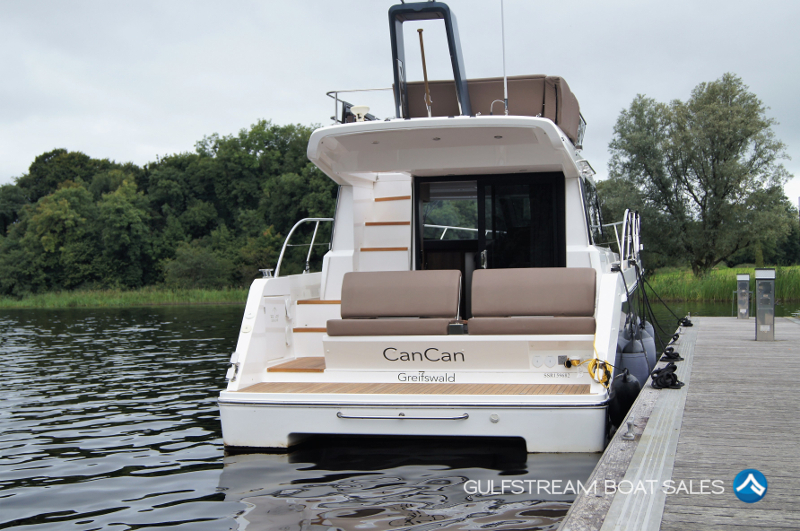 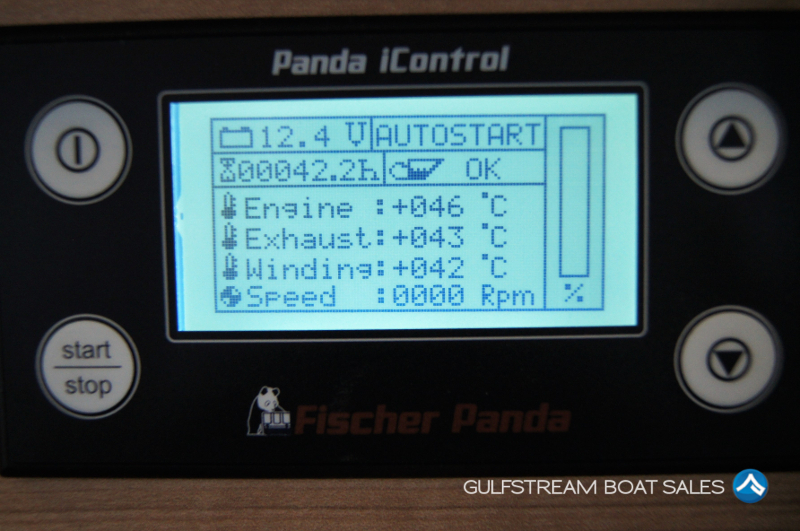 We’re extremely happy with it and now can’t wait to get it on the water. 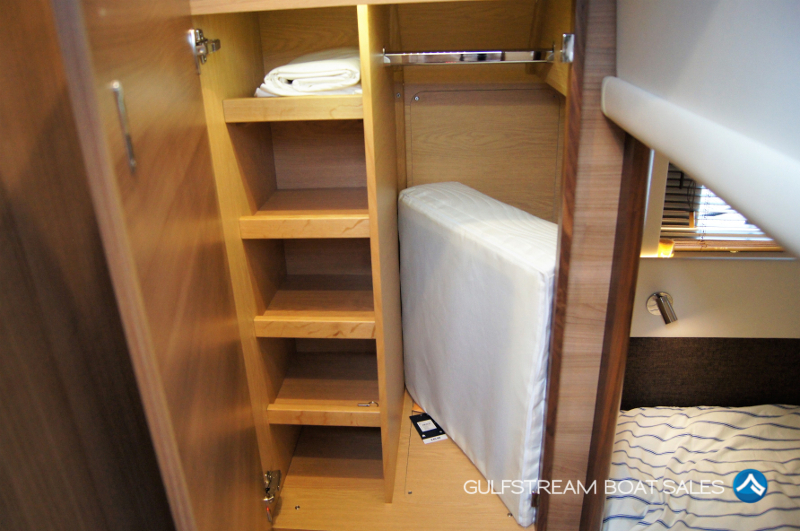 Thanks also for the bottle of champagne, a very nice touch.